Wishing you many blessings and good times with the ones you love this holiday season! Wow. How is it already the beginning of December? Thanksgiving has come and gone and now it's time to think about Christmas again. Still, even as this is our second Christmas in Kenya, it feels strange. The weather is certainly not reminiscent of Christmas in Idaho. It's sunny and often quite hot some days. But we are not complaining. Overall, we are feeling very thankful to have an entire year under our belt and to feel like we know what we're doing so much more this holiday season - we even cooked a turkey (for the first time ever) in our oven for Thanksgiving! The older kids are nearly finished with their first term of school for the year. And as always, we are SO thankful for this school! 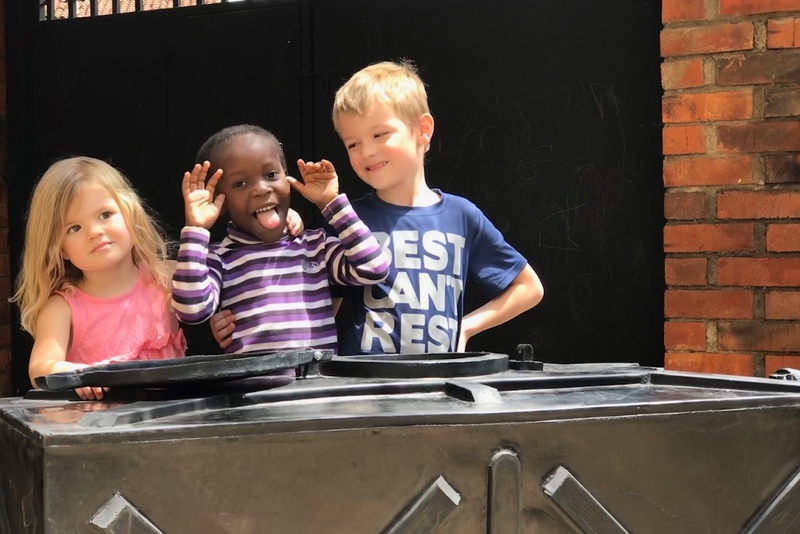 Zuri has made so many new friends and she absolutely loves going to school. Her class (just like every class at the school) eats lunch together everyday out on their covered deck. Rain or shine, they are out there. Her main teacher, Teacher Tabitha, is the one at the head of the table. She also has an assistant teacher in her class, who is an intern, and will likely only be with them until the end of the term next week. Her name is Teacher Pretty, on the far right of the photo. Moses is learning to knit in his class! It has been said that knitting is more important than homework at Waldorf. And that is certainly true of Moses's class - he doesn't have homework! 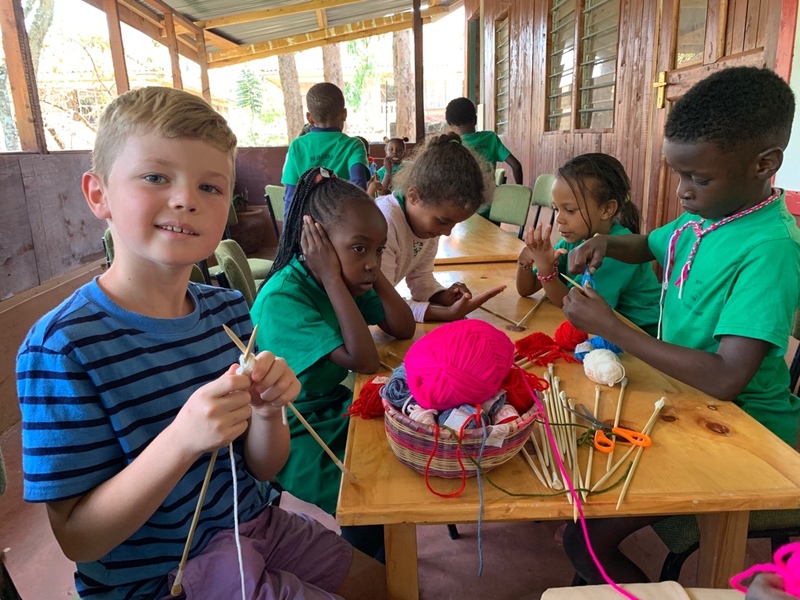 But knitting is helping to perfect fine motor skills and has been said to improve memory, work both sides of the brain and prepare children to be better readers when they are ready for that step. Not only are they knitting, but before they began knitting, they had to carve their knitting "needles" out of sticks of bamboo wood. How cool is that?! 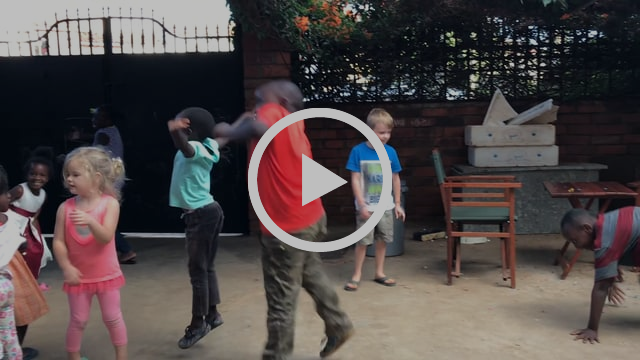 Last month we shared a video of our friend Ellie who serves on the Kenyan Coast. 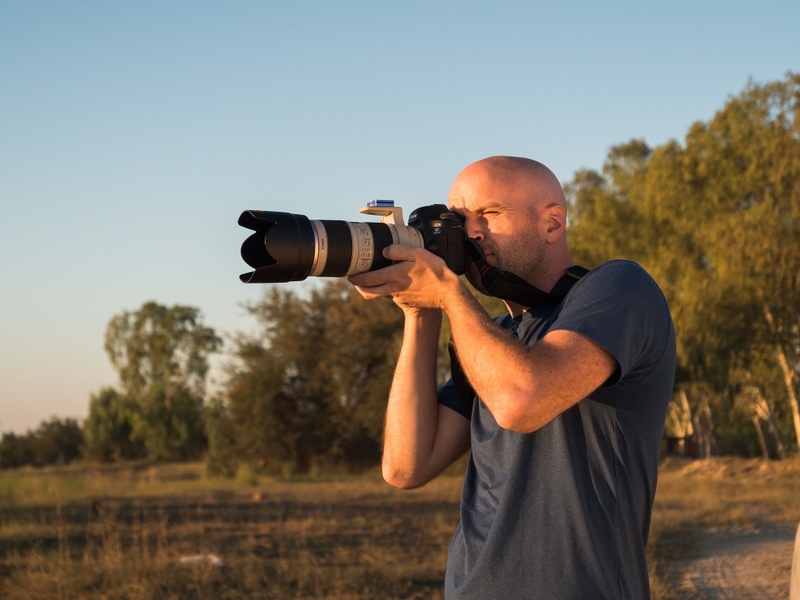 This month, meet Justin, an American serving in Chad. If you could sit down and listen to a few heartfelt stories of a missionary's journey, what would they share? What factors brought them to this unusual place? How has God revealed himself to them? 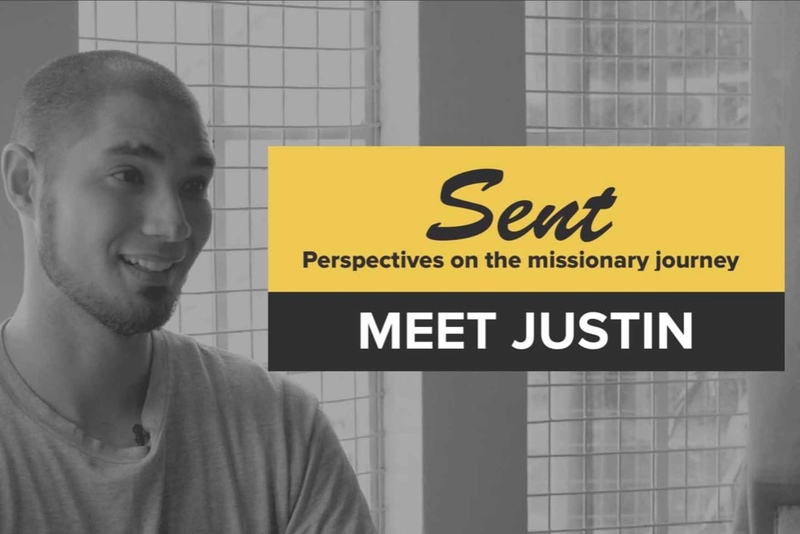 Click here to see the interview with Justin, a real person who represents what it means to be a real missionary. Imperfect. On a journey of discovery. Sharing God’s heart for the nations and privileged to be caught up in His redeeming work in Africa. Also, Some of you have been asking about the work of the media team that Jordan is on. Much of the team's work is available to read and watch on the AIM Stories website here. Also, many of the stories end up in Heartbeat Africa, a biyearly publication of Africa Inland Mission. Supporters are mailed this publication, and you can also sign up for the digital version here. Our team was able to get out of the city for a few nights this past month and it was glorious! 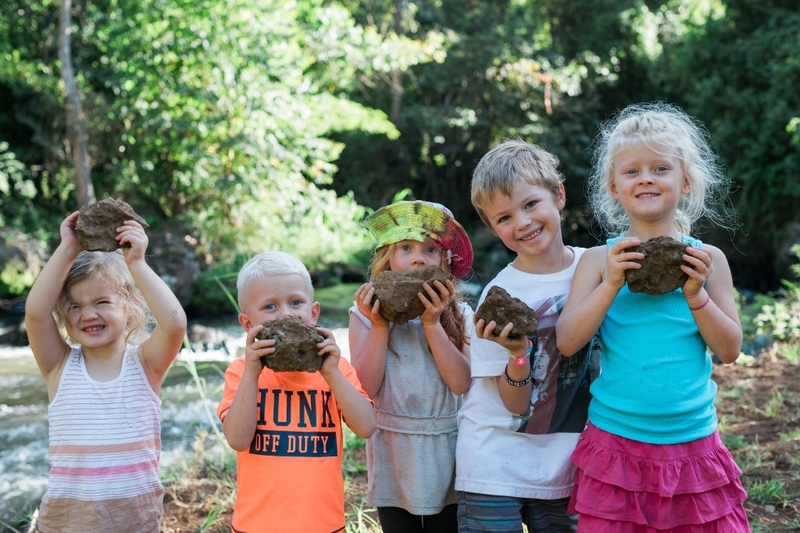 A dried-up riverbed made for some fun adventures!! Our team has been somewhat discombobulated this past year. What we mean by that, is simply that we haven't all been in Nairobi together very much over the course of this past year. People have left Nairobi for home-assignments (both long and short), for support-raising needs, and for bereavement leave. All good reasons, but it has meant that we haven't been all together very much this past year. So, getting away as a team (even though one family was still missing ) was a necessity! And it was wonderful! Jordan's little photo assistant fell asleep on his back! Jordan and the other photographers on the team absolutely loved going out and exploring with their cameras. There was so much to see and capture. We were about two hours south of Nairobi in a much more desert-like area, and the terrain was so different. The Maasai tribe predominantly lives in the area, so we were able to chat with the Maasai kids as they herded their cattle - Jordan and the older kids even saw a bull-fight one morning! The water in this little pool was from a well, hence the brown color, but our kids absolutely LOVED it! The house we stayed in had this wonderful little pool for the kids to swim in. Honestly, that's probably the sole reason we chose this house. And, it was far enough out of town to feel like you've really gotten away, but not too far that the time it took to get there was more than half your day. It was just a few hours drive, and the pool was such a blessing (especially since it was quite a bit hotter there than in Nairobi)! Mateo is just a happy guy! And for that, we're so thankful!! Along with the wonderful little pool, the house we stayed in had this amazing covered deck with a few sofas and lots of giant pillows to relax on. 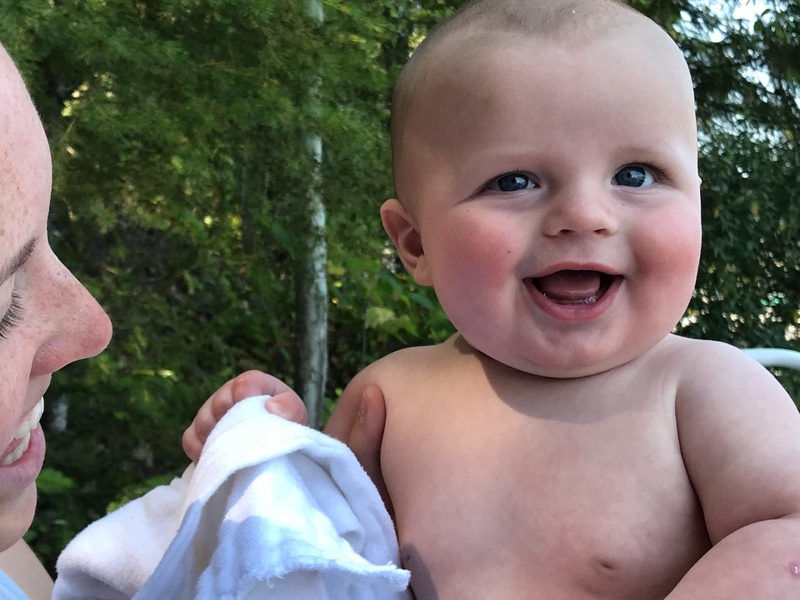 Mateo loved being outside with just his diaper and a drool bib on! He also loved crawling around and exploring a new place. He is such a happy kid and we're so thankful for the little guy he's becoming. Full of joy! This past month Jordan has been able to bless many missionary families with family photos for their Christmas and prayer cards. He's amazing and so, so creative!! 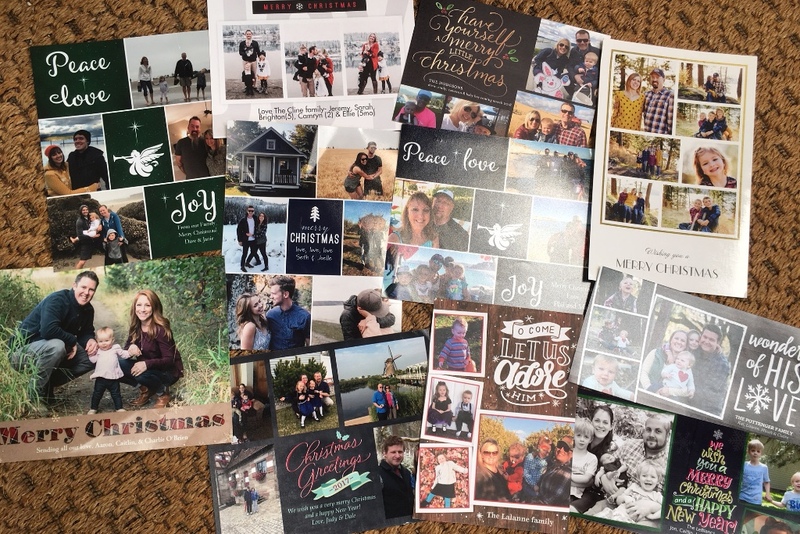 As part of his role with the On Field Media team, Jordan has had the opportunity to bless nearly 20 missionary families with updated family photos for their prayer cards and Christmas cards. And he's done all those photo sessions in the past two weeks! Needless to say, he's been a busy guy! But as you all know, family portraits are hard to come by, and often they're expensive, so he has felt so blessed to be able to help these families in this way! Teacher Esther (Moses's teacher) came for a home visit the day before Thanksgiving! Both of our kids were SO beyond excited to show her this place they call home! Moses has been waiting for a month and a half to have his teacher visit our home, and she FINALLY came! All the kids in his class signed up for certain dates to have her come, and the day before Thanksgiving happened to be the date we got. It was wonderful. Moses was so excited! Zuri may have been even more excited! 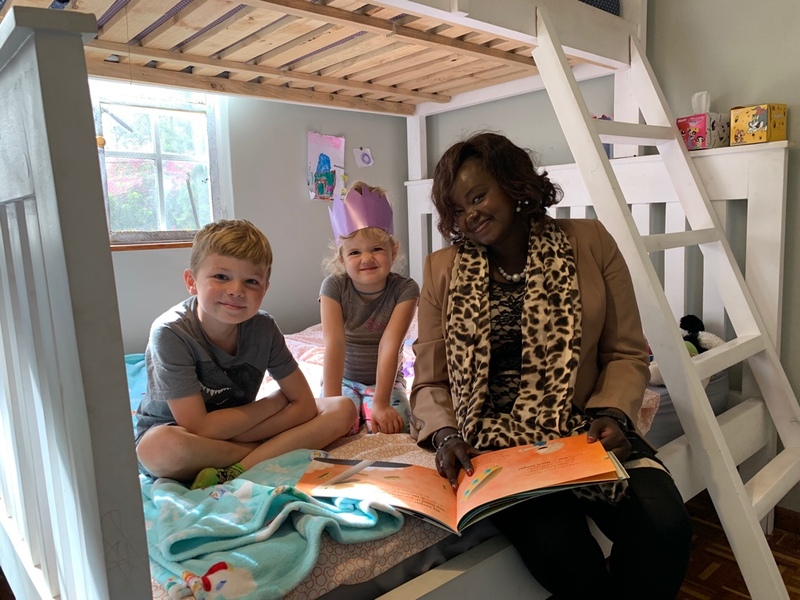 Teacher Esther read Moses and Zuri a book in their room, had tea and cookies at our table, and toured the grounds where our house is. We really love her and her intention with Moses and all the students in her class! She's really amazing!! 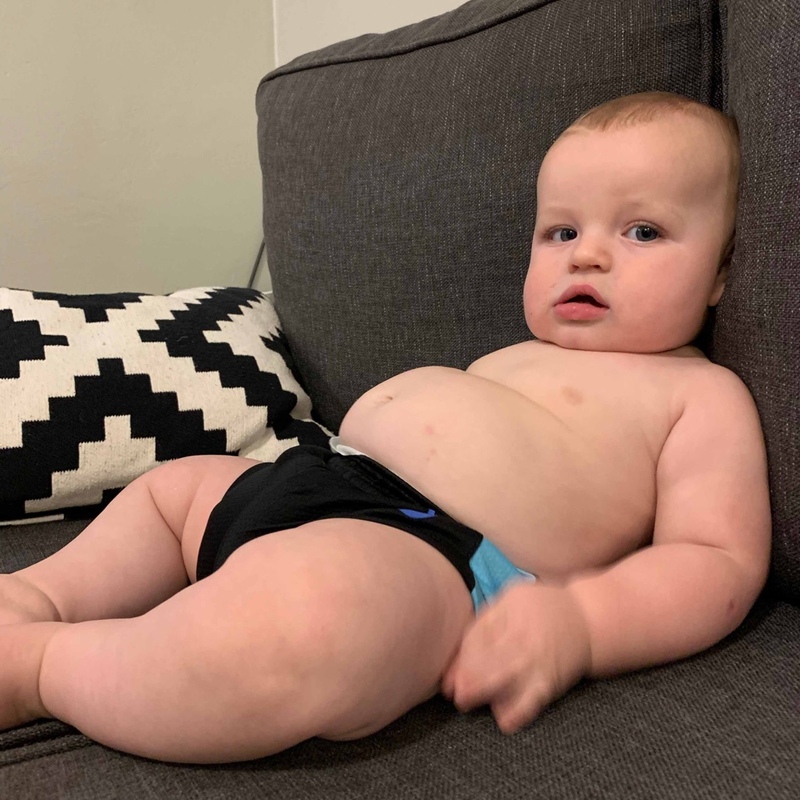 We're just going to leave this right here: Mateo's post-Thanksgiving bod. For a wonderful Thanksgiving with other American friends who are far from home too. For the Nairobi Waldorf School and all the teachers and staff there - we feel truly blessed by all the people who love our kids! For a chance to get out of the city for a few days with (almost all of) our team. We're learning how important these getaways are in developing positive team dynamics. For endurance to finish the year well - Jordan has a lot on his plate, media-wise, and a lot to accomplish before the end of the year. For teammates leaving the field and for new teammates coming to the field. More transition in the coming months. Pray we can say goodbye well and that we can welcome the newcomers well. For hearts to be open to the love of Christ, specifically those who don't know him at Waldorf. Some there are believers, as we have said, but many are not. Pray that we could love them well as a reflection of Christ's love. Thank you for praying and partnering with us in this ministry! Moses having fun with kids from his class on Field Day. We are loving this new rhythm we find ourselves in. Every weekday Jordan takes Moses and Zuri to school. They leave the house around 8am or a little before. Zuri gets out at 1 every day, so Kristin goes and grabs her then (except for Wednesdays, when she gets to stay after for her ballet class). Moses gets out at 3:15 everyday, so Kristin goes and grabs him then (except for Fridays when he is out at 1 with Zuri). Gosh, we are so thankful this new school is only a 10-15 (sometimes 20 at the most) minute drive from our new home! The kids are loving it, and so are we!! Mateo gets a little more one-on-one time with mommy these days! 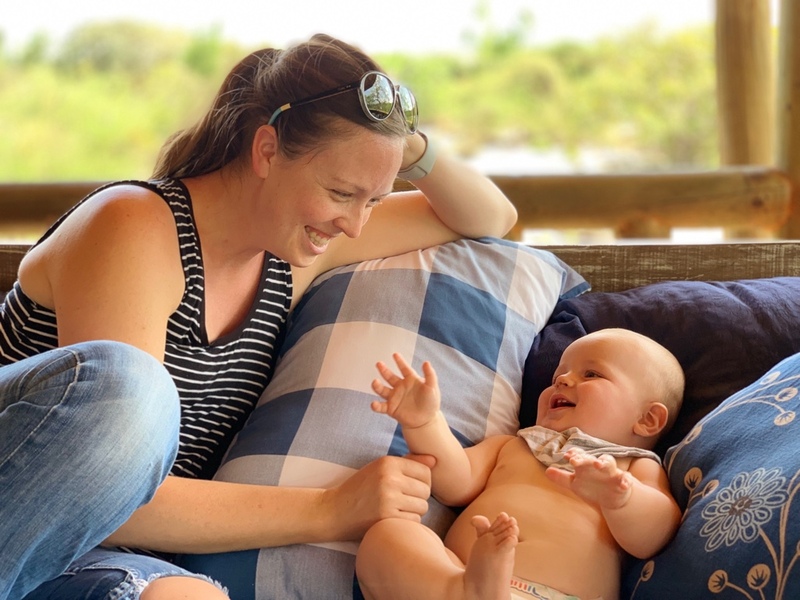 Mateo is just the sweetest and Kristin is loving having a little one-on-one time with just him in this stage of his life. If there's one thing we've learned through having kids it's that they don't stay little for very long. We were literally just talking the other day about how Moses is about to be seven. SEVEN. How in the world did that happen?! Mateo will be there before we know it (and Zuri too) so Kristin especially feels so blessed to slow down (and not be homeschooling) and just enjoy her time with him right now. 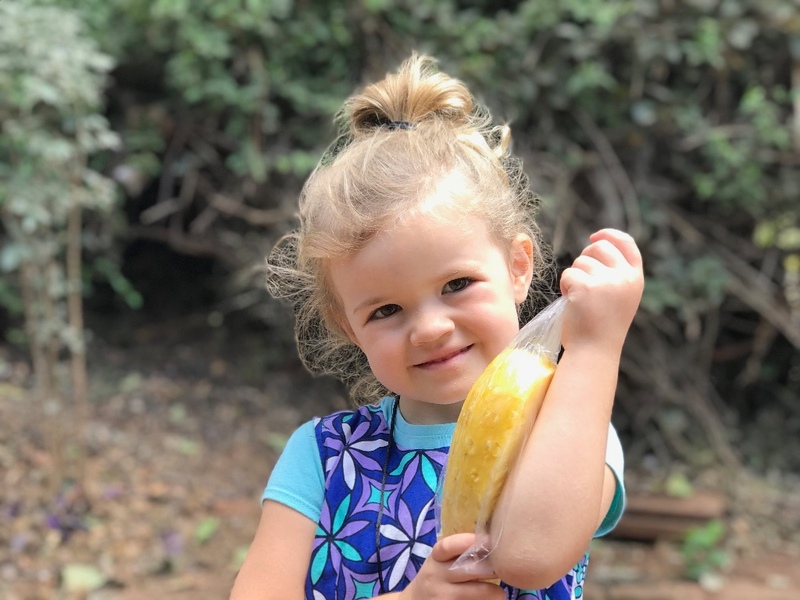 This girl loves walking to the little fruit/vegetable stand just around the corner from our house. The fruit and vegetable selection by our new house is admittedly not quite as good as the selection by our old house, but we still have quite a bit we can grab just around the corner. 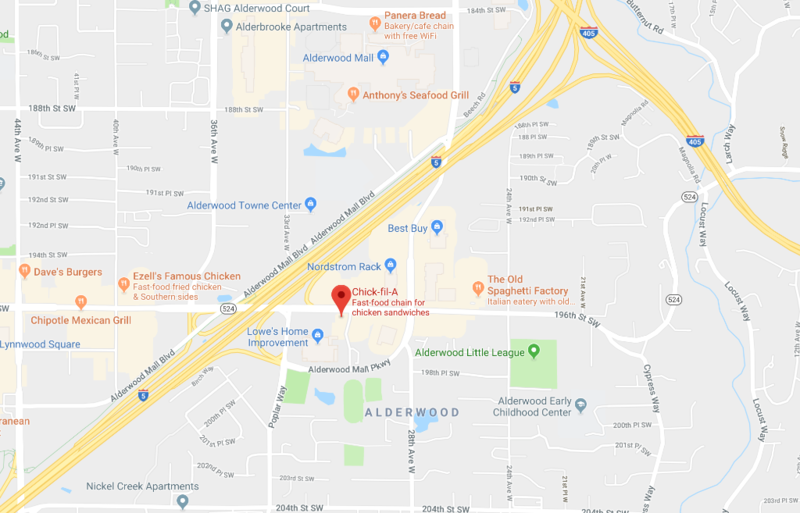 Not to mention, we also have Kristin's favorite restaurant (a burger joint reminiscent of one of our favorite burger joints in Los Angeles) within walking distance now! So we're not complaining. And this girl loves going with us whenever she's around. She's quite the adventurous little lady and often she brings a smile to all the people she meets! On Field Media, the team Jordan serves on, recently has launched this new video series called "Sent"
Not extraordinary in and of themselves. But they travel a different path than most. A path of submission to God’s call and will. A path of service, sacrifice, and sometimes suffering. 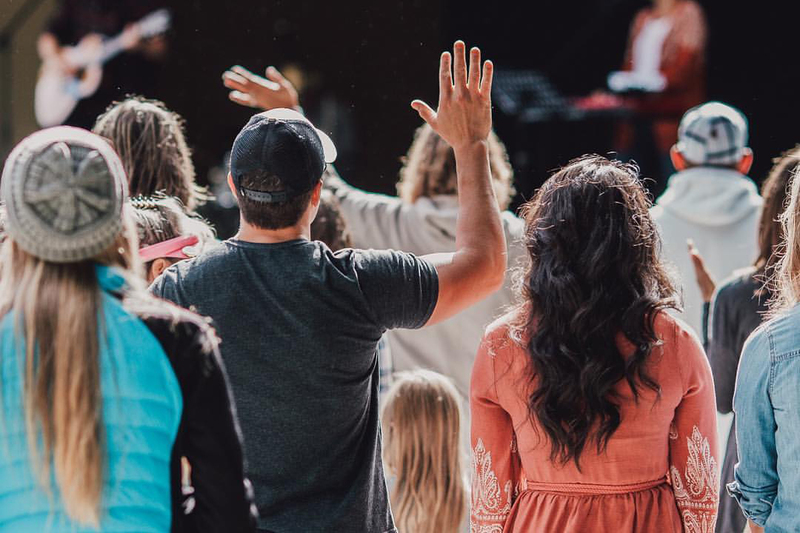 They cross oceans and cross cultures and then somehow find a way to live a normal life – all while being a stranger in the place they call home and being a messenger of the gospel where there are too few. Life plays out against a backdrop of the unfamiliar, and sometimes, the unbelievable. If you could sit down and listen to a few heartfelt stories of their journey, what would they share? What factors brought them to this unusual place? How has God revealed himself to them? 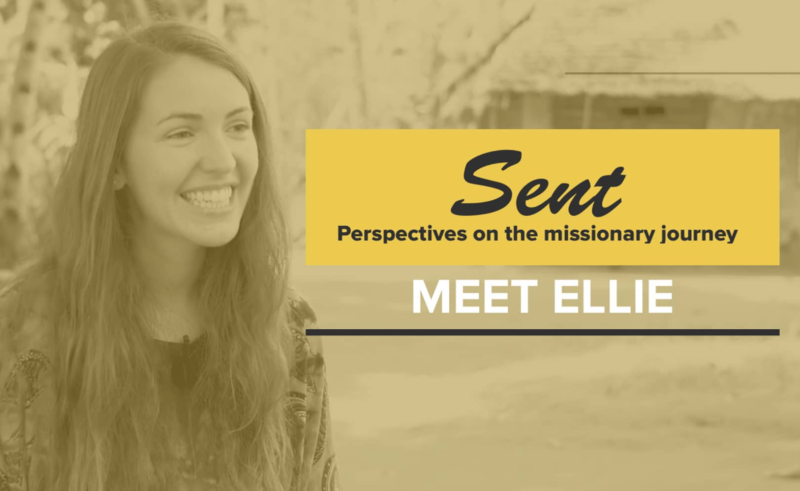 Click here to see interviews with some of the real people who represent what it means to be a real missionary. Imperfect. On a journey of discovery. Sharing God’s heart for the nations and privileged to be caught up in His redeeming work in Africa. Moses with some of his friends at the Nairobi Waldorf Tea Party a few weeks ago. 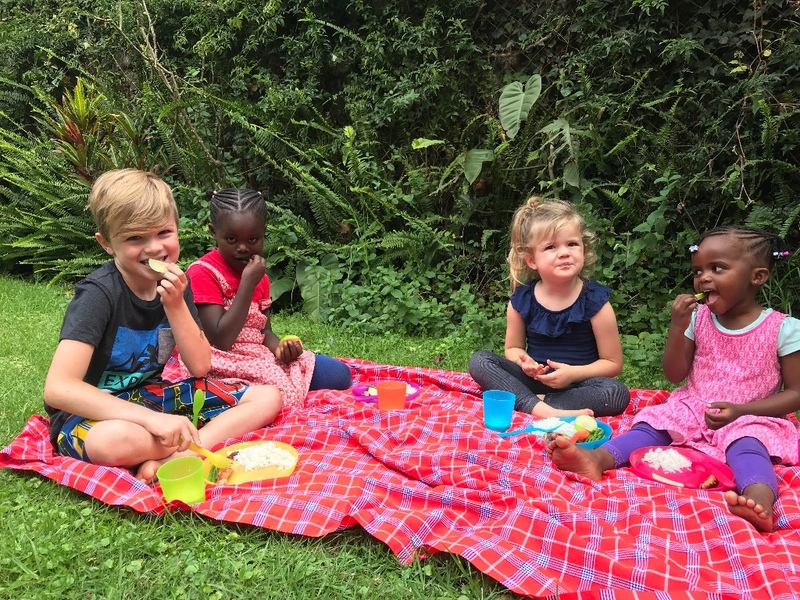 Just before the kids mid-term break, the Nairobi Waldorf School had its annual Tea Party, where all the parents and kids from each campus come together for food, fellowship and fun. It was a great opportunity for us to meet some of the parents of the kids in Moses and Zuri's classes and the kids so enjoyed seeing their classmates outside the classroom! Our hope is to continue to develop relationships with these families and hopefully share Christ with them. One of Moses's closest friends is from a Muslim family. Would you join us in praying for open doors with them as we get to know them? Just being silly at our house! This past month has been another month of adjustments, and sometimes we just need to stop and be silly. Nowadays, that's what weekends are for! 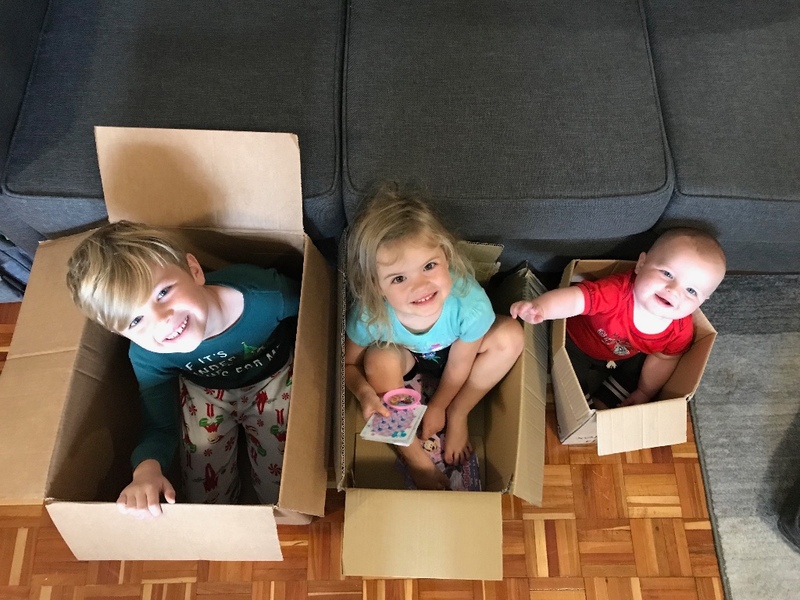 So last weekend, Jordan put all three kids in three boxes we had lying around and they played and played. Even Mateo loved it! His favorite thing is when he get to be one of the big kids. He'll watch and watch them, and whenever he gets included in what they're doing, he's all smiles and giggles. It's adorable! 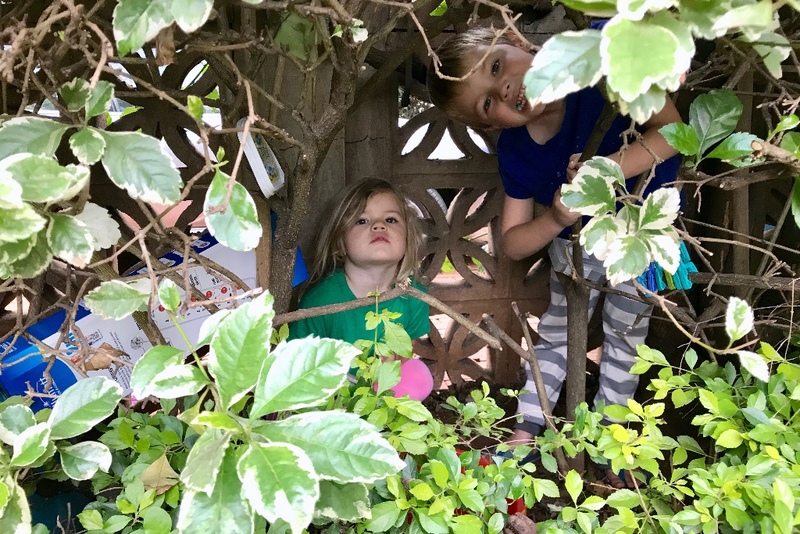 Zuri planting flowers with her friends at her class's Garden Party! 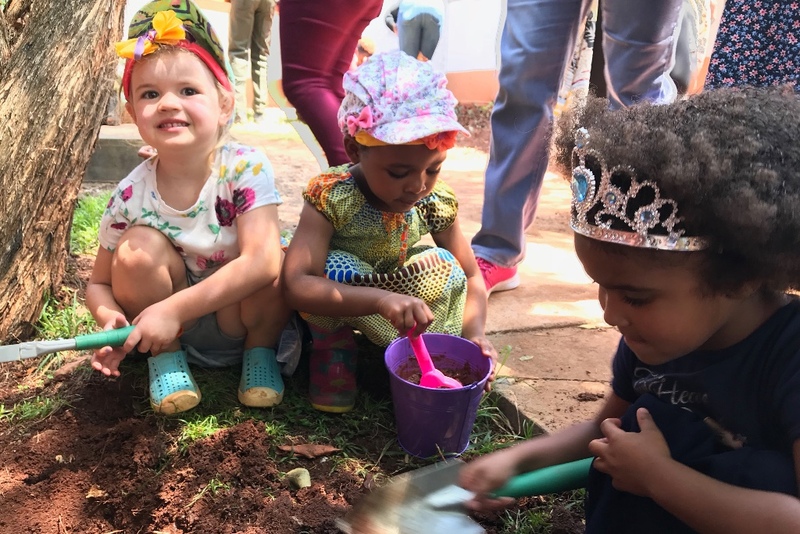 On the last day of school before the kids mid-term break, Zuri's class had a Garden Party where we planted flowers in anticipation of the short rains that are coming later this month and throughout November. It was hilarious to watch and be a part of a group of four and five year olds decide where and how to plant the flowers. Honestly, they had more fun filling buckets with water and making mud than actually planting anything! After snacks and mealtimes, Zuri and her classmates wash their own dishes! Kristin spent the entire school day with Zuri in her class. They started out by going down to the large grassy area in the middle of the school for circle time, which Moses was a part of with his class, so that was a surprise (the first graders, or "class one's" as they are called here usually don't participate in the preschool/kindergarten circle time). The kids and adults did lots of singing and dancing. Then it was time for crafts, which eventually led to the creation of the headband on top of Zuri's head in the above pic. The view from Zuri's class looking down on the big grassy area where the kids do circle time. After we completed the craft (and spent time on little extra crafty side projects, such as the aforementioned headband), it was snack time and time to circle up again to get instructions for planting . Then we got dirty and finally planted the flowers. After that, we did one more circle time (just for fun to sing and dance again and to celebrate all together the beauty that had been planted). Lastly, we had lunch together - a delicious meal of rice, lentils, chapati (Kenya's version of a tortilla, but with more oil and a bit sweeter), cabbage/carrot salad and watermelon. What a great way to end the first half of the first term! This little guy (who's officially SEVEN months old now!) has had a pretty bad cold for the past week and a half. He's a trooper, though, and rarely complains. But this has been the status of his nose for nearly this entire time. Actually, I think finally today his nose is starting to clear up. But would you say a little prayer for him? That he kicks this cold to the curb soon? We stopped on our way to Nanyuki to grab lunch in a tree house! 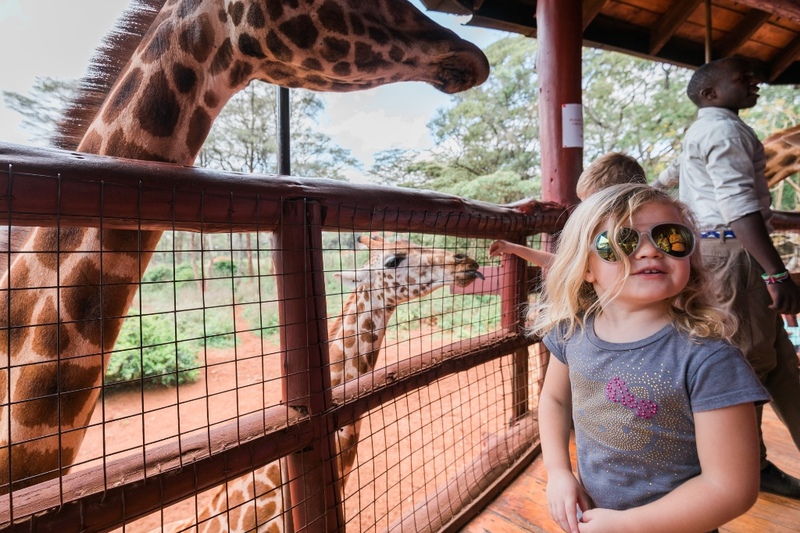 For the kids mid-term break, we jetted out of town and up to Nanyuki, which is right on the Equator (about a three hour drive north of Nairobi). We have lots and lots of pictures and stories to tell of the adventures we had - we went on Safari at Ol Pajeta Conservancy (where the last two living Northern White Rhinos live), we went to an animal orphanage, where we all got to pet a Cheetah (and lots and lots of other animals), the kids got to ride a giant tortoise who was over 100 years old, and we just had a wonderful time getting out of the bustling city for a few days! Stay tuned for our next newsletter for all the details on that! For this new rhythm we have now. Our kids are loving their new school and we couldn't be more thankful! For new friends for both Moses and Zuri in their classes. We are slowly getting to know the parents and families of their friends and we are all loving it! For a chance to get out of the city for a few days. 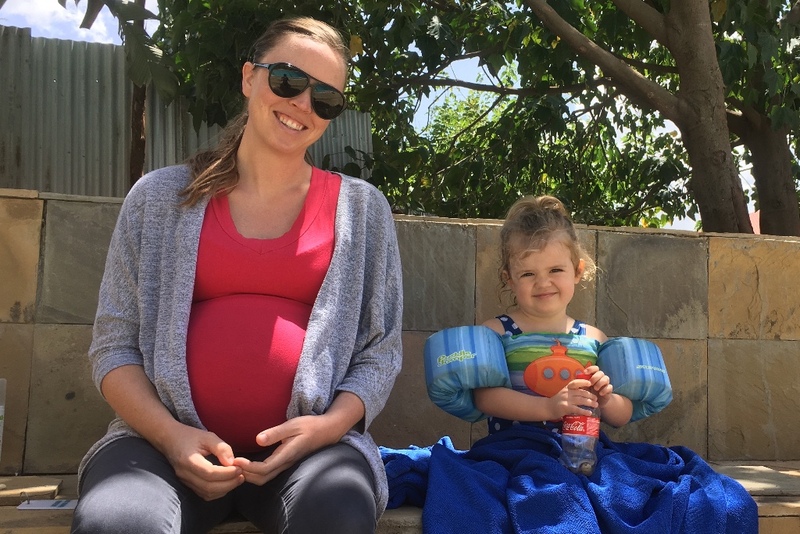 We really didn't explore Kenya much at all last year (pregnancy takes its toll on Kristin), but it's a beautiful country and we are so thankful for the opportunity to get out more now! For the funds that have come in towards our kids school tuition - God is faithful to provide always! For the remaining funds to come in to cover our kids tuition this year. We are nearly there, and it's been so amazing to feel so loved and cared for by so many in this new adventure. Thank you to all who have given toward this! Truly, we couldn't do it without so many of you!! For hearts to be open to the love of Christ, specifically those who don't know him at Waldorf. Some there are believers, we are learning, but many are not. Pray that we could love them well as a reflection of Christ's love. Daddy and Mateo being silly just outside our home. We landed in Kenya two weeks ago. And it's been a bit of a whirlwind since arriving. The kids started school last week and we are just falling into some sense of "normal" with that. 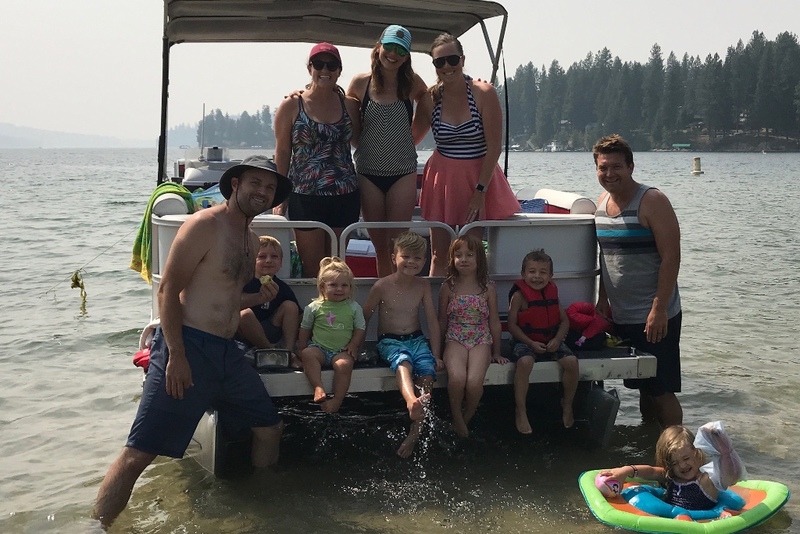 But before we share all about our life moving forward, we'd love to take a moment to look back on our time in Coeur d'Alene this summer. Here are some of the highlights. This girl lived in her swimsuit most of the month of August! So many of our days were filled with good friends and family! We so enjoyed catching up with so many people we hadn't seen in a year. There's just nothing quite like an actual hug and sitting face-to-face with the people who are so dear to us. Truly, it filled us in ways we didn't even know we needed to be filled! 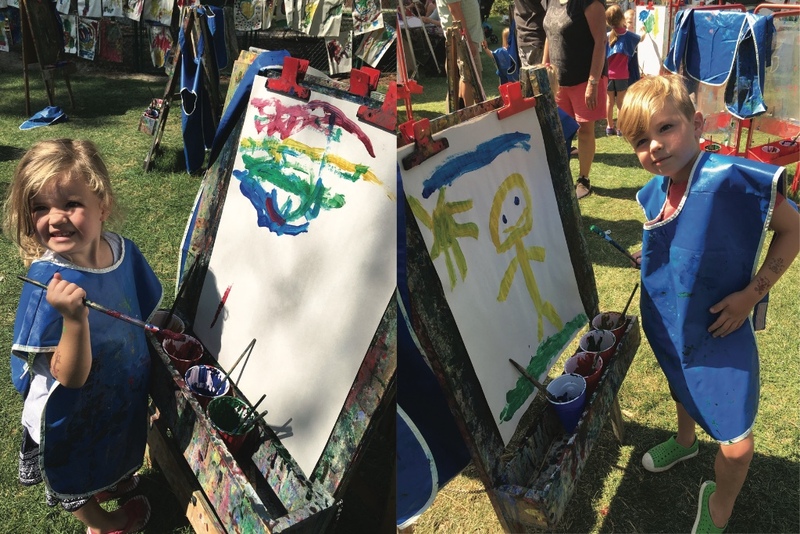 The kids loved painting at an outdoor art festival in Coeur d'Alene. You guys - there are so many parks in Coeur d'Alene! Just so much wide open green space. It's amazing! We're pretty sure we have never appreciated parks as much as we did this past summer. What a treat it was to meet people at a park and let our kids run around and play - and paint and do all sorts of crafts and fun things too! Seriously. There are no parks in Nairobi like the parks there. There's one on the opposite side of town that we venture to every now and then, but it's not the same. So we took full advantage of so many of the parks while we were there! 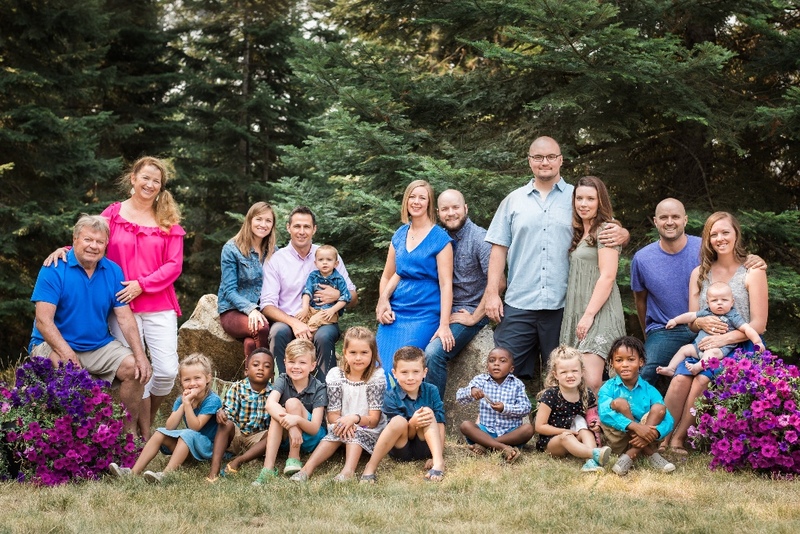 Jordan's side of the family - his parents, his older sister, his two younger brothers, us and all the spouses and kids! Jordan's entire family gathered at his parents house in Hayden for a week of craziness...I mean fun. We ended up lovingly calling it "family camp" because it really felt like the kids were at camp and all of us adults were the counsellors. Jordan's parents now have ten grandkids, so when it came time for meals, we just lined up plates and piled everything on for nine kids (Mateo is still too young for a plate). But as crazy as it was, we loved it! One of Jordan's brothers lives in Austin, Texas, one of them lives in Coeur d'Alene, and his sister lives in Los Angeles, California. What a treat it was to have everyone together for an entire week! Our sending church, Anthem, had us share at both of their Sunday gatherings. 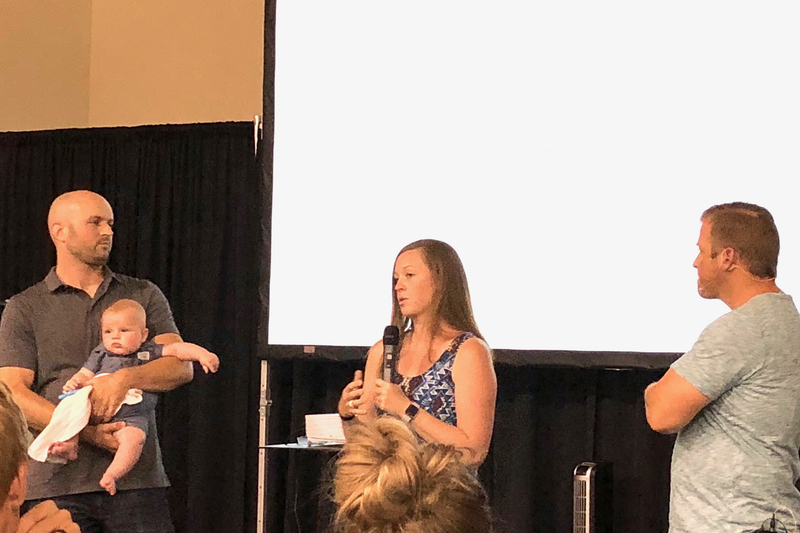 We also had the opportunity to share briefly at both of the Anthem Church gatherings in August. What a blessing to be able to update our church family on all that has happened in the last year and to be prayed over and sent back out for another year here in Kenya! We feel so loved by so many! Enjoying lake time with good friends! The lake is so refreshing to all of us. Really. It's hard to explain. But there are no lakes here like the lakes around Coeur d'Alene. 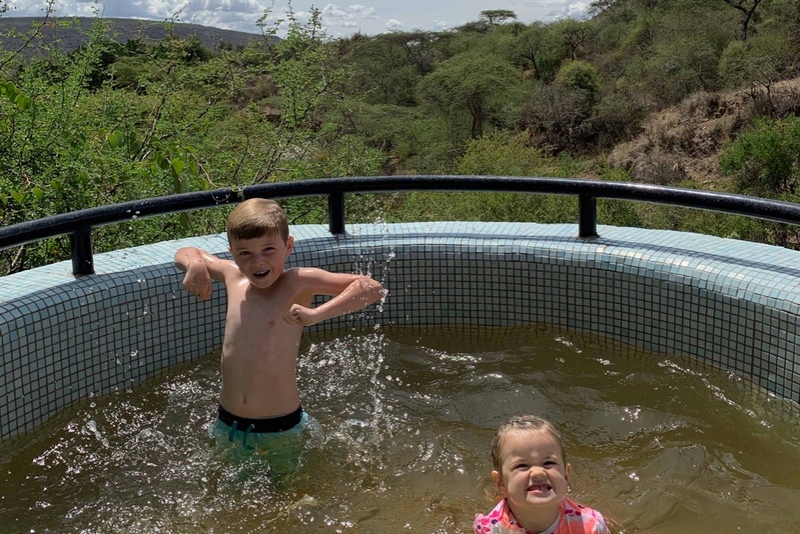 The lakes that are outside Nairobi are either full of crocodiles and hippos (and super muddy) or they are alkaline lakes, which makes them great places for flamingos, but not great places for us to swim. I am realizing more and more as I get older that I'm a "lake girl" at heart. I grew up at the lake, I lifeguarded at the lake, I love the lake. It fills me up in a way that nothing else does. Just being on the lake calms me. What a treat it was to enjoy the lakes with so many friends and family! 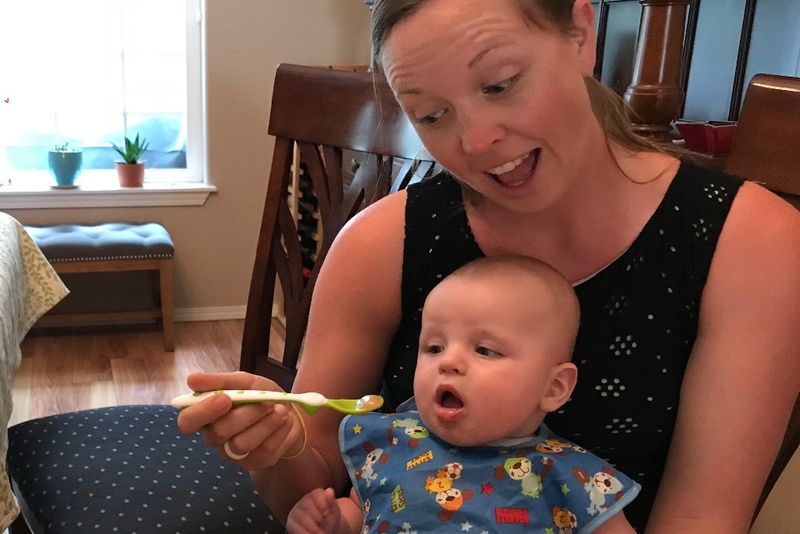 Mateo tried real food for the first time while we were in Coeur d'Alene! Applesauce! He loved it! This little boy is growing and changing SO FAST. What is it about the third? It just seems like everything is accelerated. He's huge. He has two teeth already. He's decided sleeping through the night is finally ok with him (he won't starve ). He giggles all the time. He rolls over. He's moving into size four diapers. And now he's all about the real food. He's not even six months old yet! Time slow down, please! Kristin's side of the family - her parents, her two older brothers and their girlfriends, and us. 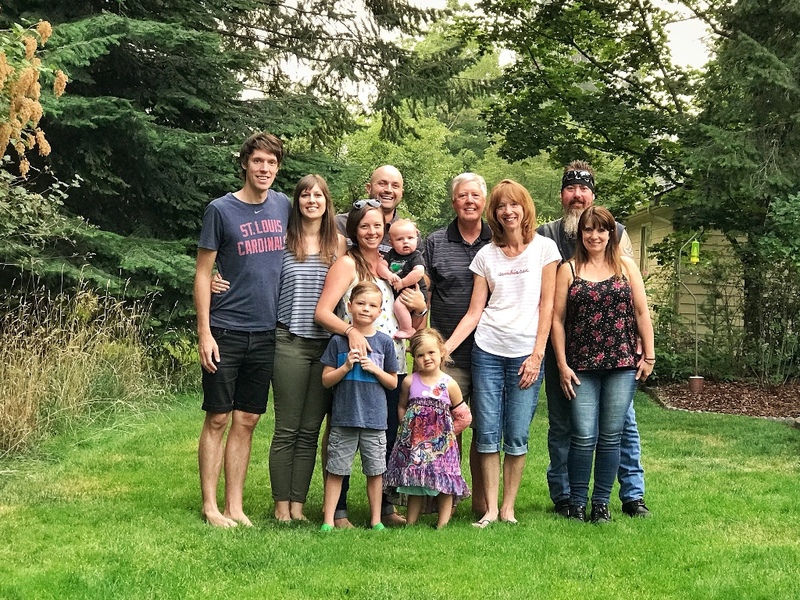 Kristin's entire family was also able to get together this summer at her parent's house in Hayden. One of her brothers lives in Post Falls and the other one lives in Portland. They both work a lot, so it was a real treat (for her mom, especially) to get everyone together for a BBQ. Our kids loved reconnecting with their uncles and it was great to introduce Mateo to them too! Zuri got her cast off! Four weeks after it went on. We are so thankful for God's timing - on and off all while in the USA! Our little girl is quite the bruiser. She's also a bit accident-prone. 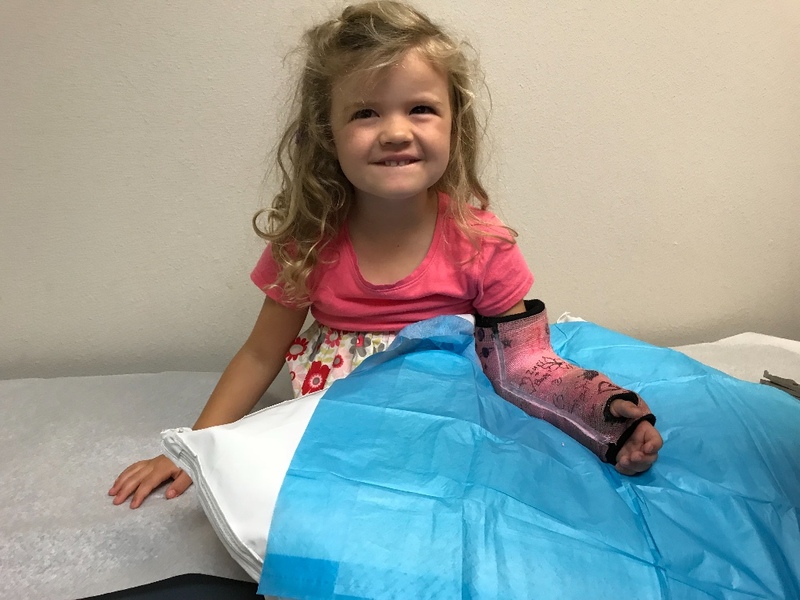 Any other parents out there have any advice on how to help her not break any more bones? Haha! Oh if only we actually thought it were possible for her to not break another thing...alas, it feels much less a matter of "if" she'll break something again and more a matter of "when" she'll break something again.Thankfully, she broke her arm just after we arrived in the US, which meant she was able to get the cast on and off while we were there. What a blessing! One last hurrah in Vancouver with these sweet friends before boarding the plane to head back to Kenya! As we mentioned before, flights in and out of Vancouver, BC were much cheaper than flying into Spokane or even Seattle. So that meant we got a few more days at the end of our trip with some of our best friends before heading back to Kenya. They just love us so well and it feels so restful to be with them. Truly, it was just what we needed after such a crazy, fun, incredible, exhausting (in the best way) time in Coeur d'Alene! These two have just started at their new school! Pray for them, and us, as we all embark upon this new season of life! 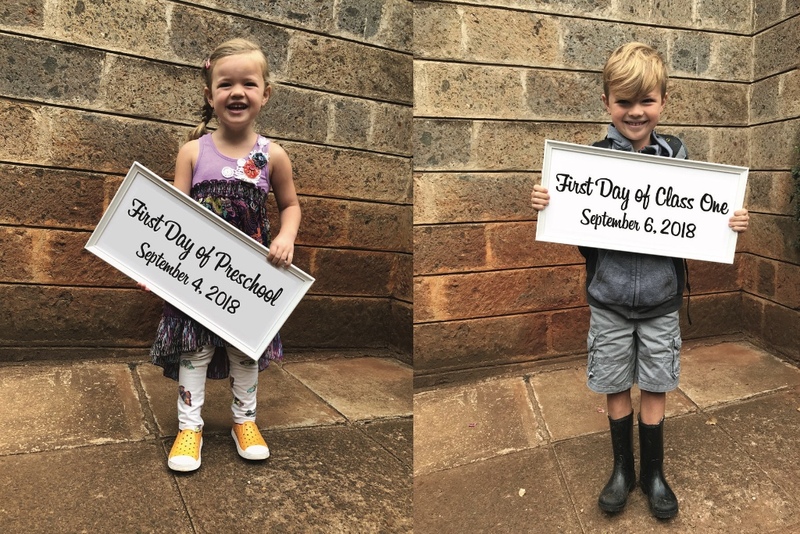 As we mentioned at the beginning of this email, our two oldest have started at their new school - the Nairobi Waldorf School. Their first week was wonderful and crazy all at the same time. Zuri started a few days before Moses, which was fine, but not something we were totally prepared for. Moses's class had a special open house for all the parents and kids to meet each other, and then the next morning they had a special rose ceremony to officially welcome them into "Class One" - as it's called here. It was all good stuff, it just meant a lot back and forth from home to school. And traffic was especially bad last week - so pray for patience for this mama. We're all excited and hopeful for what God's going to do through us being a part of this school! For such an incredible time in the States this summer! We feel so refreshed and ready to be back here in Kenya for another year. For surviving the long journey back to Kenya with three kids. It was not easy plowing straight through from the West Coast (with just a four hour layover in Paris) but God is so good! For the start of the new school year at this new school. We are so thankful that our kids are in school this year! For the Holy Spirit to comfort one of our teammates, Mark, and his family. They unexpectedly lost his brother to a car crash a few weeks ago. Please pray for them all during this time of grieving. For funds to come in to cover our kids tuition at their new school. Thanks to some timely one-time gifts, we were able to pay for their first term, but we're not sure how we'll pay for the rest of the year. But, again, God's got this. Pray that we can simply trust him in that. For grace as we resettle into life here. It's quite the adjustment being back - traffic alone is nearly killing Kristin, so pray for an abundance of patience! For our kids to be loved well by their teachers and all the helpers at their new school. It's always a little scary letting your kids go into the care of others. We got to see the Eiffel Tower on our long layover in Paris! We have officially been back Stateside for three weeks now! 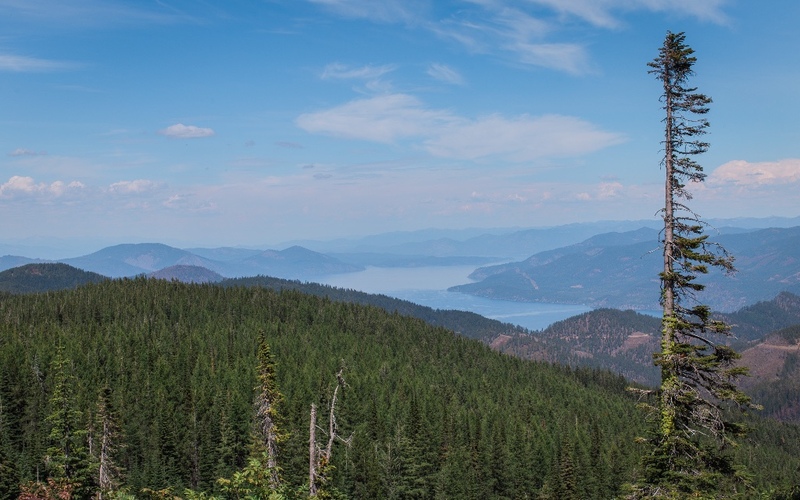 Our journey to get to Coeur d Alene was filled with adventure and a bit of insanity (on our part as parents). 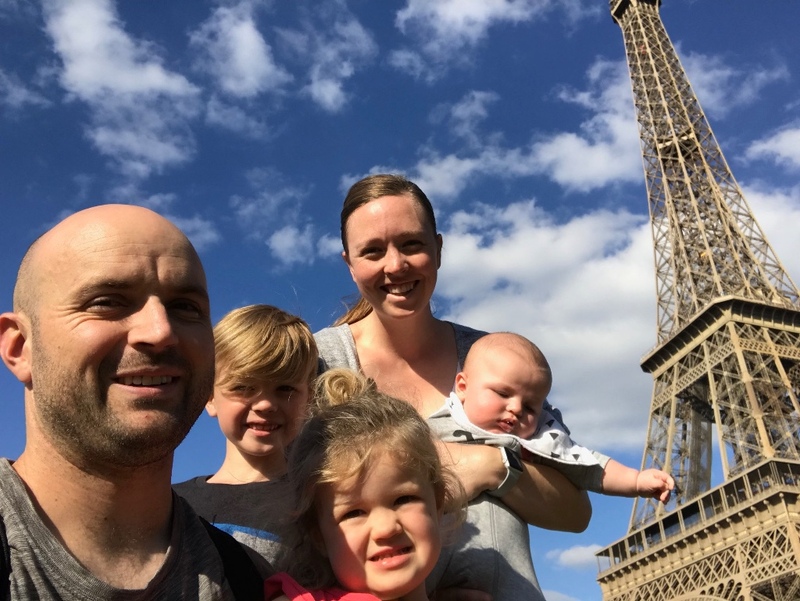 For some reason, we got this crazy idea to take all three kids on two trains from the Paris airport to the Eiffel Tower. That journey is over an hour each way, and we knew that going in. Yet, we decided to go for it anyway! There were a few meltdowns, but we made it there and back and it was AMAZING! 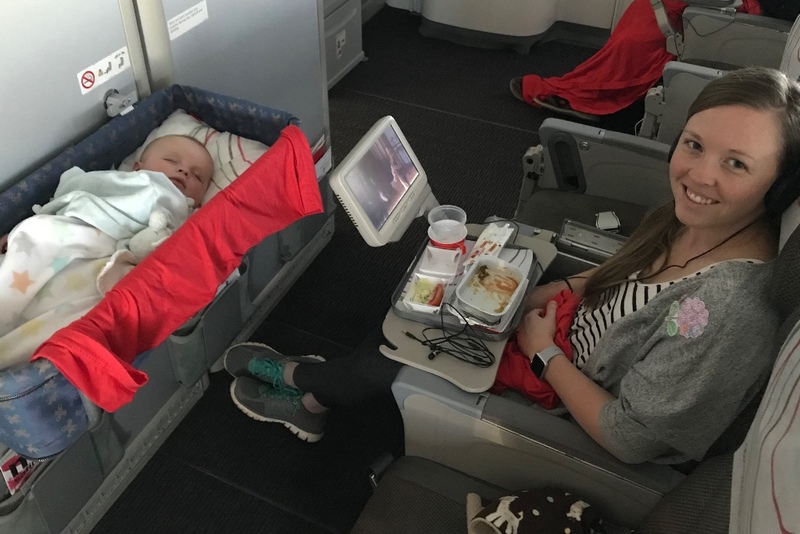 Our flight from Nairobi to Paris had lots of empty seats so Mateo got to sleep in the bulkhead bassinet! The journey was long, as it always is. We flew from Nairobi to Paris, which is an eight hour flight. Then we had a 20 hour layover in Paris, so we spent the night in a little hotel at the airport. Then we flew from Paris to Vancouver, BC, which is a 9.5 hour flight, but our plane was a bit delayed taking off so we were on that plane a total of nearly 11 hours. By the end of it, we were all SO ready to get off that flight! But again, we made it! 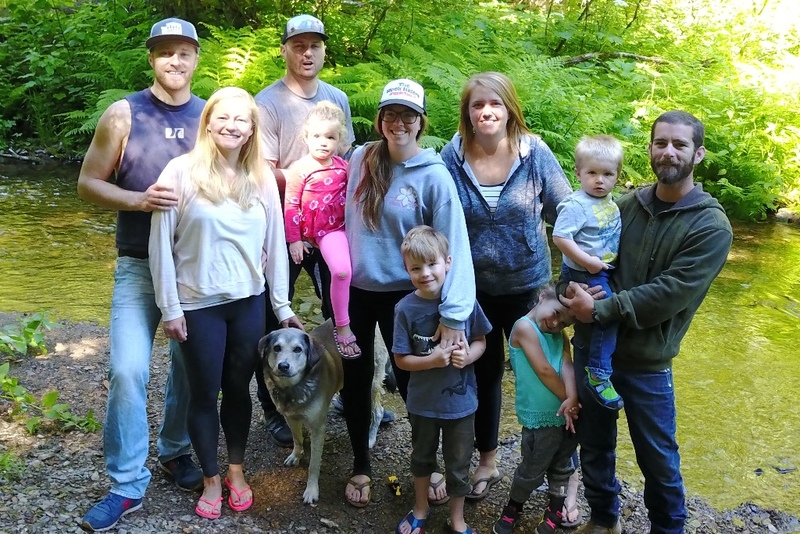 And we were greeted by some of our very best friends, who had blueberries and raspberries in the car for us - the BEST way to be welcomed to the Northwest!! Our first stop was Vancouver, BC for some time with precious friends! Our time in Vancouver was short, but oh so sweet. We stayed three days with our very good friends who also serve with AIM but are back on Home Assignment right now. Since they know what it's like to fly across the globe with young kids, they created such a wonderful place to land. We went to bed early without judgement, we picked blueberries and raspberries off the bush at their home, we ate sushi for the first time in over a year, we went to the ocean, we went to a park with green grass and trees and safe play equipment, and we got to enjoy wild-caught fresh salmon! All of those things may not mean much to you, but to us they were heaven! 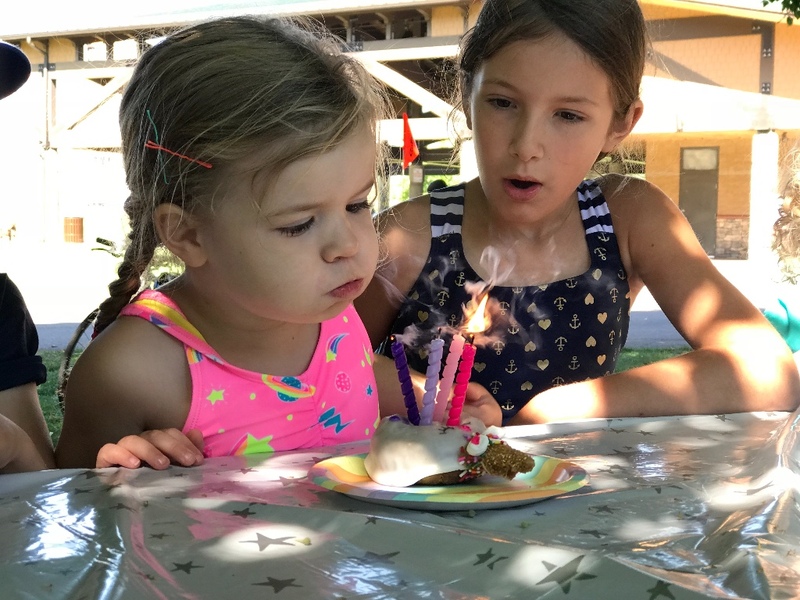 We celebrated Zuri's 4th birthday on July 21st! Not even a week after arriving in Coeur d Alene, our little girl turned FOUR! We celebrated with good friends and family at a splash pad in town. A splash pad! With clean water running all through it! Now that's certainly something that does not exist in Nairobi! It was magical and our little lady certainly felt loved! 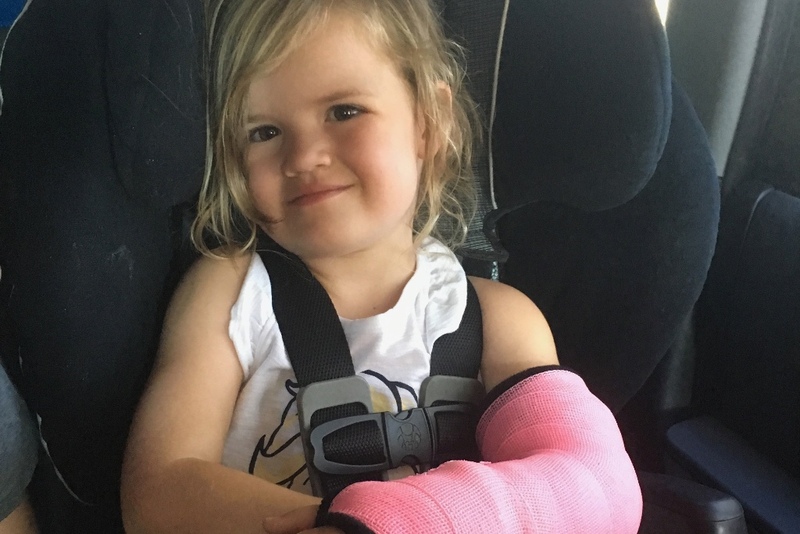 Zuri broke her arm...again. This is the second time in two years! The night before Zuri's birthday, she broke her arm. Ugh. She was climbing a ladder on a swing-set and just slipped and fell. That was a Friday night, and her party was on Saturday morning, so she powered through the party (she's super tough) and we got it x-rayed Saturday afternoon. She was in a sling until Monday morning when we could get it casted. What a weekend! 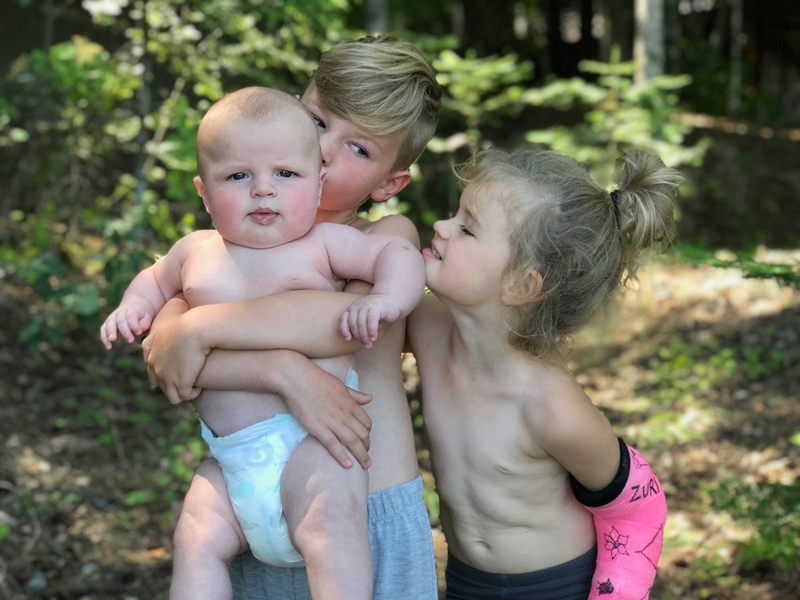 But this time she got to have a PINK cast and hopefully it will come off after two weeks - please pray with us for that because we're trying to enjoy as much time in the lake as we can while we're here! We don't get much opportunity to swim in Nairobi. 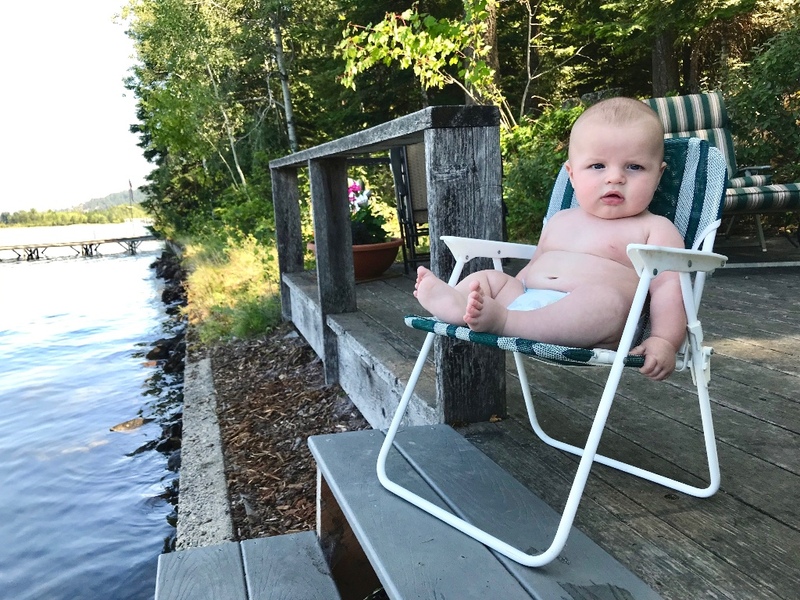 Mateo just chillin' at Kristin's family cabin! 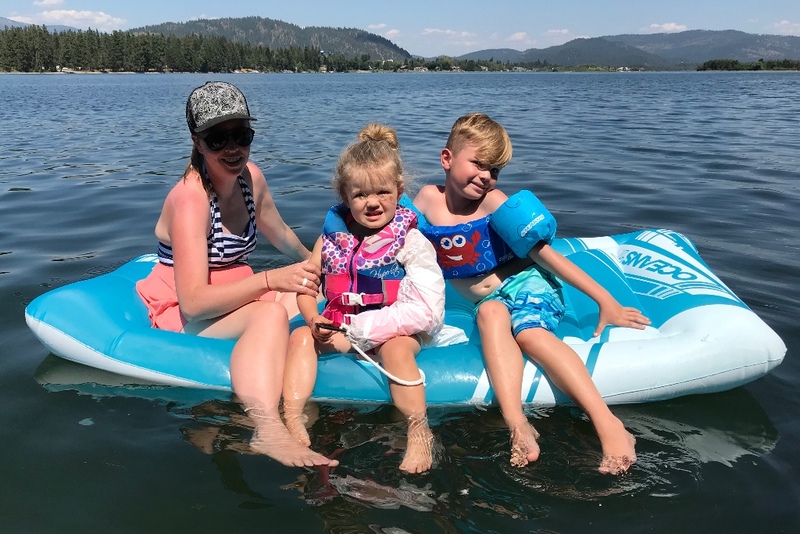 We've had a packed schedule thus far in Coeur d Alene, just trying to see all our friends and family, but we've managed to take a day here and there just for our family - to focus on our kids. 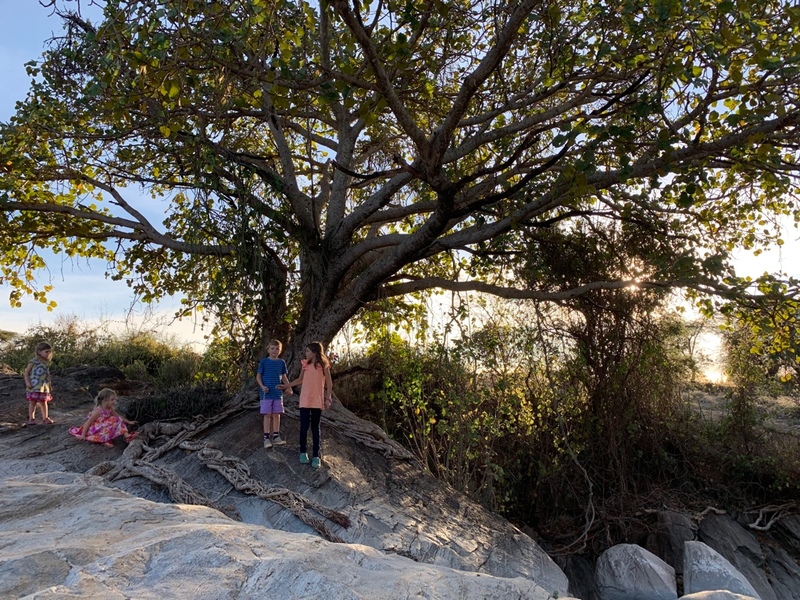 One of our good friends in Nairobi suggested we set aside quality time just for our kids, so they don't feel left behind or like they're not important in the midst of us trying to talk and catch up with so many people. So we're trying to be intentional about that. We had the opportunity to sneak away to Kristin's family's cabin for a night and it was AMAZING!! Lake time is the best time! Any orthopedic doc's reading this - just look away. She's not really on a tube on the river with a broken arm... We wouldn't allow that...Uh, or I guess we would. Sorry! The girl absolutely LOVES to swim! It's been really hard to keep her out of the water! We're not allowing her to go all the way in, but we've compromised by wrapping her cast in a plastic bag and allowing her to sit on tubes in the water. That way she can at least get her feet in! Poor girl. But she's tough, and we're so thankful for her attitude - she literally NEVER complains about her arm! We're basically trying to enjoy all things water while we're here - swimming, boating, tubing. And that includes fishing! Moses loves to fish and Zuri has decided she also really loves it! 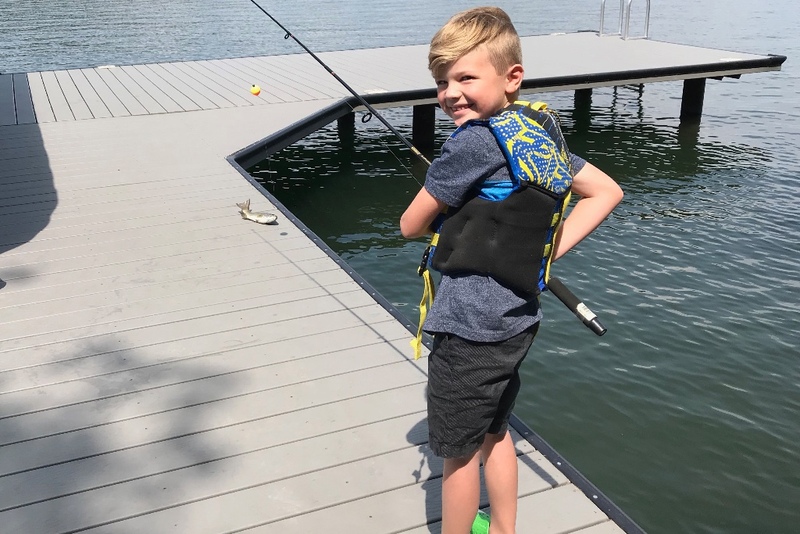 It's such a fun activity for them - I mean just look at that face 🏼 when he caught his first fish! Sharing with our church family! It hasn't been all play while we're here! We've also had work to do - like reporting to our church family on what God's been up to this past year and the direction He's leading us in this coming year. We have felt so loved and supported by so many and it's just amazing to be a part of what God's doing. He's on the move in the Northwest and throughout the globe, and we're all called to be a part of it in different ways. What a blessing to share more about the part God's called us to play! 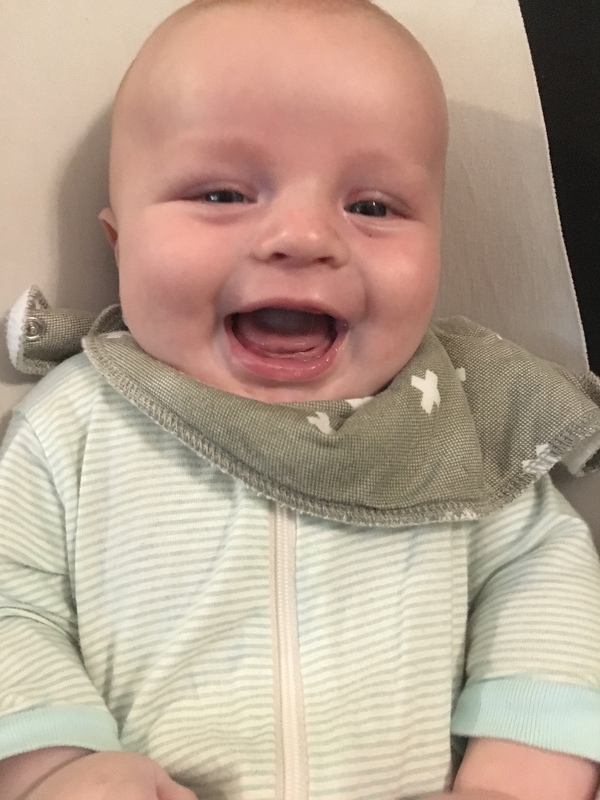 This guy is just a happy camper most of the time! So...it turns out our kids just keep on growing. Which means they are always in need of the next size up for clothing. If any local friends reading this have any of the following sizes, and you were planning on donating the clothes anyway, we'd love to take them off your hands for you! We mostly need summer clothes. Nairobi is fairly warm. Moses basically never wears pants or long sleeves. But Mateo can use all types of clothing (short sleeves, long sleeves, shorts, pants, sleepers). And Zuri mostly just needs short sleeves and shorts, skirts or dresses. If you have anything you think we could use, we'd SO appreciate it!! Seriously! Please just shoot us a text (208-640-6147) or reply to this email and we'll find a time to meet up and take the clothes off your hands! 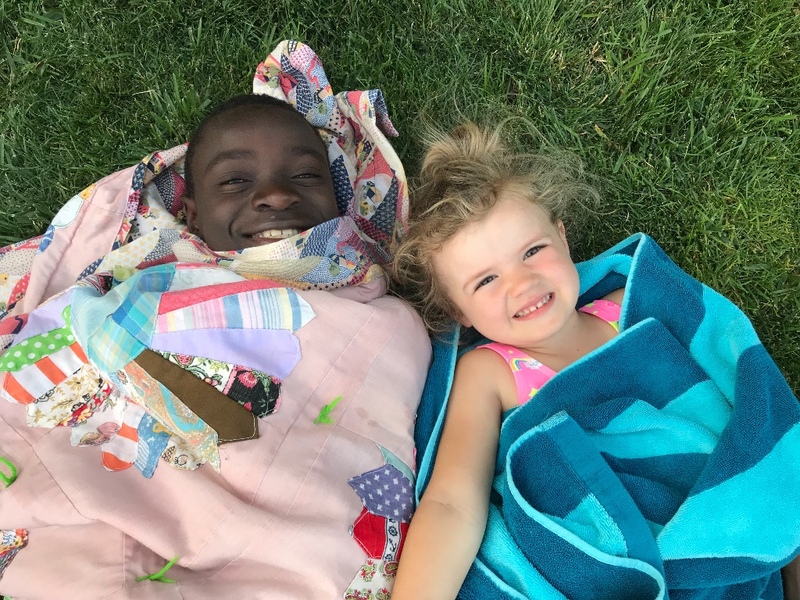 We are all so excited for Moses and Zuri to start school on September 4th! 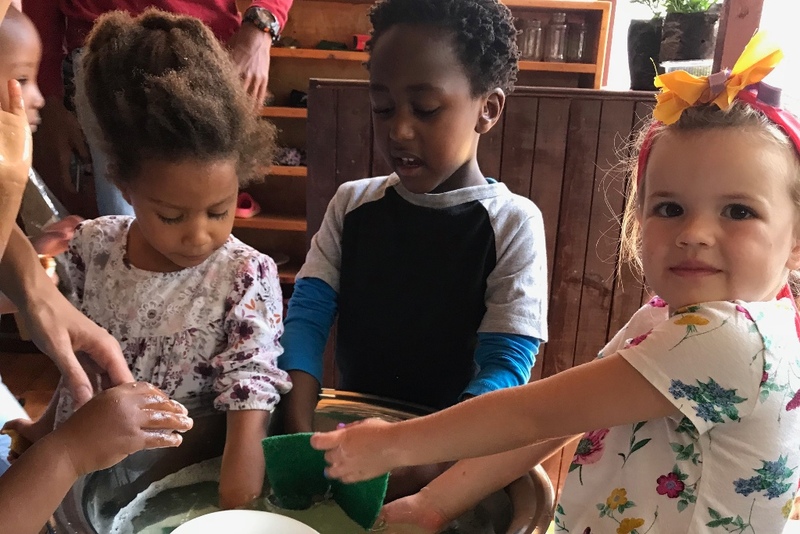 Last month we shared about how God has called us to trust him and put our kids in the Nairobi Waldorf School this fall. It's so apparent that He's calling us there, and while we don't know all the reasons yet, we are confident this is the right next step for our family. But with this step of faith, comes an added financial burden to our family. We need to raise an additional $600/month for them to attend this school and right now we are 1/3 of the way there! Would you pray with us that the additional $400/month comes in before we get on the plane to head back to Nairobi on August 27th? We have full confidence that this is what God wants, so we are trusting Him to provide the way for this to actually happen! For the friends and family we're getting to reconnect with while we're back here in the States! Seriously, we feel so loved and supported by so many people! For staying healthy with our crazy schedule - we're literally all over the place, seeing so many people and somehow we've all stayed healthy (minus the broken arm...). For surviving the long journey here with three kids. God is so good! For a miraculous abundance of time multiplied while we're still here - time to see everyone we love and care about and to connect well and not feel rushed. Also for grace for ourselves as we try to do as much as we can still without becoming overwhelmed or overtired. For the remaining funds needed to send our kids to their new school. God's got this. Pray that we can simply trust him in that. For smooth travel back across the ocean in a few weeks. So excited for their first day at their new school! Moses and Zuri have just finished three "trial days" at their new school here in Nairobi. They had so much fun last week and we just feel so incredibly thankful for the opportunity for them to finally be in a school this fall! It's been a long road. 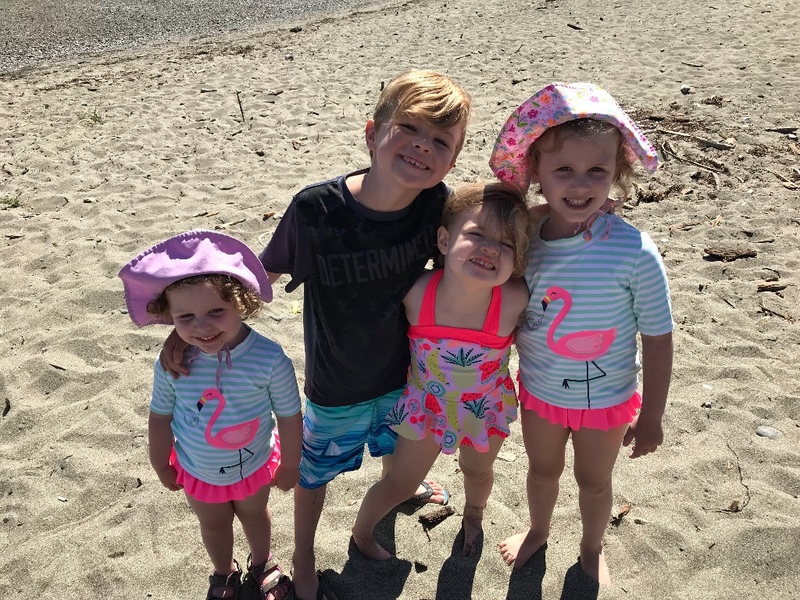 Kristin has homeschooled Moses through Kindergarten and Zuri through one year of Preschool, and while that was rewarding, it certainly had its challenges for our family (especially with the addition of Mateo in March). And as we've come to fully realize over the course of this past year, God is definitely calling us to send our kids to school. Our heart is to build relationships with locals - believers and unbelievers. And that has proven more challenging in this stage of life and in a big city than we had anticipated. The biggest hope in sending our kids to school is that we will develop relationships with other families at that school, some of whom inevitably will not be believers, and through that common rhythm of life (school) we will share the gospel with them naturally. Will you pray with us for that? Feeding the bunnies, hens, ducks and turtles at the Nairobi Waldorf School. We first visited the Nairobi Waldorf School back in October of last year. At that time, we knew we wanted to send our kids there. It's an amazing school! But the major challenge was the commute. The main campus was about a 30 minute drive from our home, and that was without traffic. During high traffic times, the commute could be an hour - one way! With a baby on the way, we just couldn't make that sort of commitment. But fast forward to now and we've moved to a new home (keep reading for more on that!) and we now live ten minutes from the school's second campus! That campus has only offered preschool and kindergarten classes up until now, but (how crazy is this?!) beginning in September of THIS year they are adding first grade! And they will add a grade each year for the next three years at least! What an incredible blessing!!! 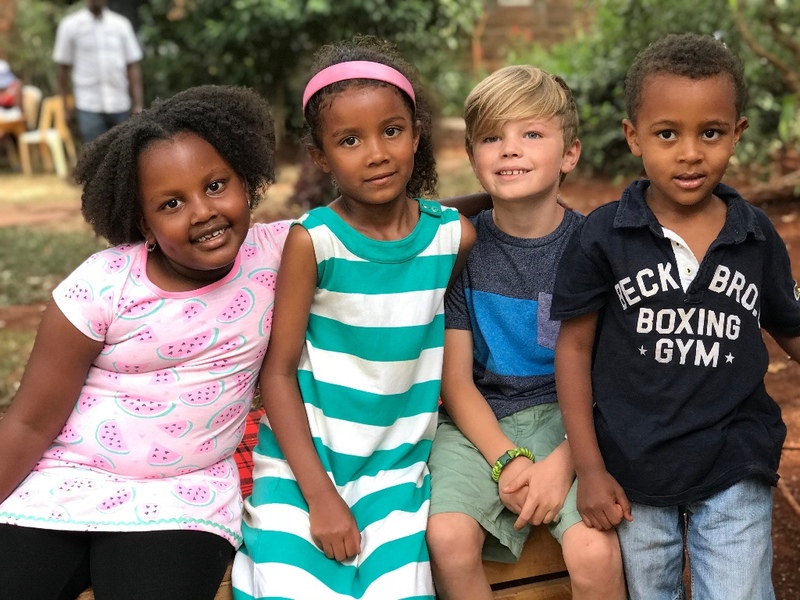 Originally, we never even considered this second campus because Moses is going into first grade, but as of last week, after our tour of the campus, we have officially applied and will be sending our kids there starting in September! What we never even considered, God had planned all along! And we all couldn't be more excited! This feels like our chance to build deep, lasting relationships outside the AIM community and hopefully with unbelievers! Being in a classroom with other kids is such a GIFT! As you may or may not be aware, free public education is not something that exists all over the world. It doesn't exist here. And we've wrestled with the cost of school, along with a whole host of other questions...Should we keep homeschooling? Can we build real relationships with other families without sending our kids to school? Will Kristin be able to keep from going mad by being "mom" and "teacher" to Moses and Zuri while caring for Mateo at the same time ? Many of those questions can be answered in any number of ways. There truly are no "right" answers. But we feel so confident that God is leading us to this school, and that means he will take care of the rest - all we have to do is trust him and walk in obedience. This girl is SO excited for school! As we do that, practically it means we have some additional funds to raise. It's $300/month for each of them to go full-time and included in those fees are a snack and a hot lunch. 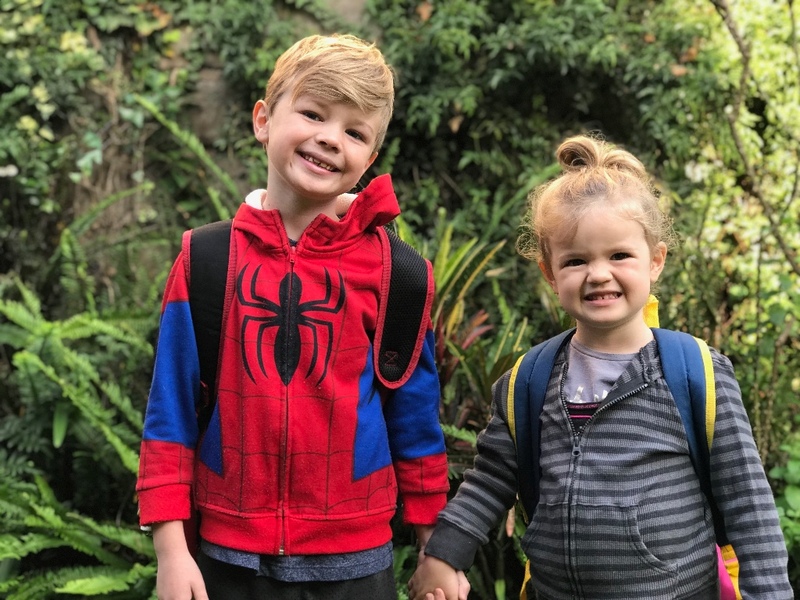 So, overall, we actually feel like we've found a really good deal (some of the British schools here are upwards of nearly $1000/month per kid!). Many of you who read this newsletter are already giving on a monthly basis for our family to live and do ministry here. Thank you! Truly, we could not be here doing what we're doing without so many of you. But if you're reading this and are not currently giving, would you consider joining with us for this - for our kids to have the chance to go to a great school and for us to build relationships with locals? If you're feeling led to join with us in this, please click HERE. Jordan doing his thing in Namibia. Praise the Lord - Jordan has returned to Kenya from a ten day trip to Namibia! Kristin survived taking care of all three kids by herself and we are all so happy to be back together again!! The trip was certainly one for the books. 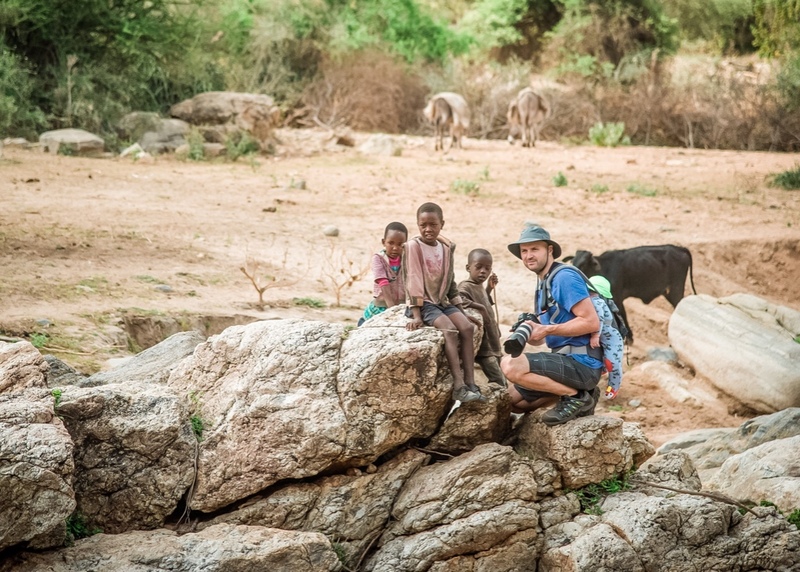 The media team was able to capture some incredible moments and Jordan got to meet some amazing people - including five San Bushmen working to translate the Bible into their mother tongue. The San people are the same people group showcased in the movie "The God's Must Be Crazy" and their language includes clicks. It was fascinating and humbling just to be with them. 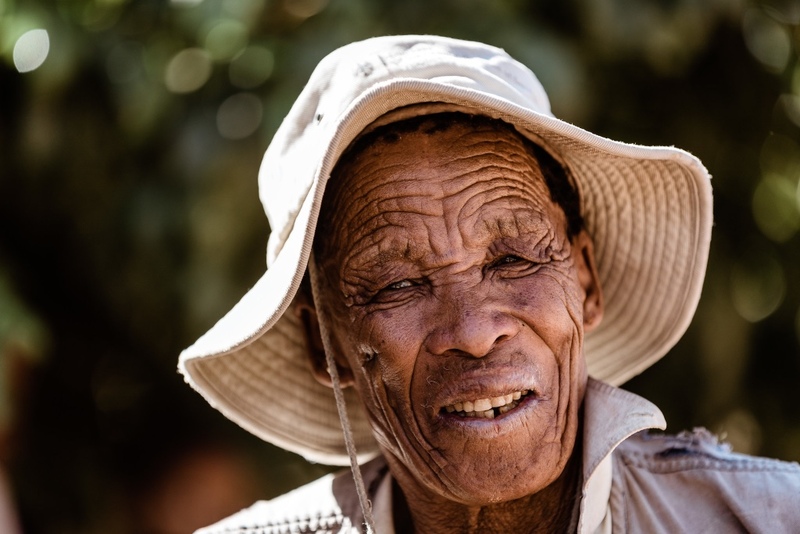 Chief Bobo - a leader of 3,000 San people who has become a believer and was baptized last year. The entire trip was dedicated to seeing how AIM can partner with Namibians in reaching other Africans with the Gospel. If you read our last newsletter you know that for most of AIM's history we have been pioneers, doers, people who went into the forests of Congo or the urban deserts of North Africa to bring the gospel to the unreached. But now our heart is to become, more and more, a mission that invites, equips, sends, trains, serves, or encourages African workers to do the same – whether together with our workers or as part of new initiatives and teams. This trip to Namibia was all about shifting our focus to mobilizing Namibians for the Great Commission and there were some really encouraging people we're hoping we can partner with in the future! Would you pray for these Namibian believers - that they would continue to reach out to their neighbors who don't know Christ regardless of what our partnership might look like? This is our new house! Well, the side of it anyways. We've MOVED! It's been quite the whirlwind since arriving here in Nairobi last August. We started out at AIM's guesthouse, then moved into a transitional house, then moved to our more permanent house just near the transitional house (but that location was hard for us because it wasn't very near to Jordan's work or the Nairobi Waldorf School or the church we're a part of here). So now we've moved into a house on the same compound where Jordan's office is. It's SUCH a blessing to be so close to where he works - he can even come home for lunch! And we are also so, so much closer to the kids new school - it's a 10 minute drive instead of a 30 minute drive! And we're just five minutes from where our church gathers on Sunday mornings! All around, the location of this house is a really great fit for us and we feel much more settled just by being here! Picnic lunch with friends in our new backyard. The new house is perhaps slightly bigger than our old house but it's very similar. It still has three bedrooms, two bathrooms and a living/dining space, but the kitchen is a bit bigger and both bathrooms have at least a shower (we only had one tub/shower in our old house). There's also a really cool attic space in this new house that serves as our storage space (for empty luggage pieces - we really don't have anything other than that to store ) and as an extra play space for the kids (very handy on rainy days and for evenings when we have other families over for dinner - the kids can all play up there after it gets dark!). It's also been the space we've used for finishing up our homeschooling. And the backyard is one of our favorite new spots! It's been so fun having picnics with friends in the lush greenery out there!! Chameleons are abundant around our new house! One of Jordan's favorite creatures is the chameleon. Those, along with praying mantises and baby goats just make him happy. 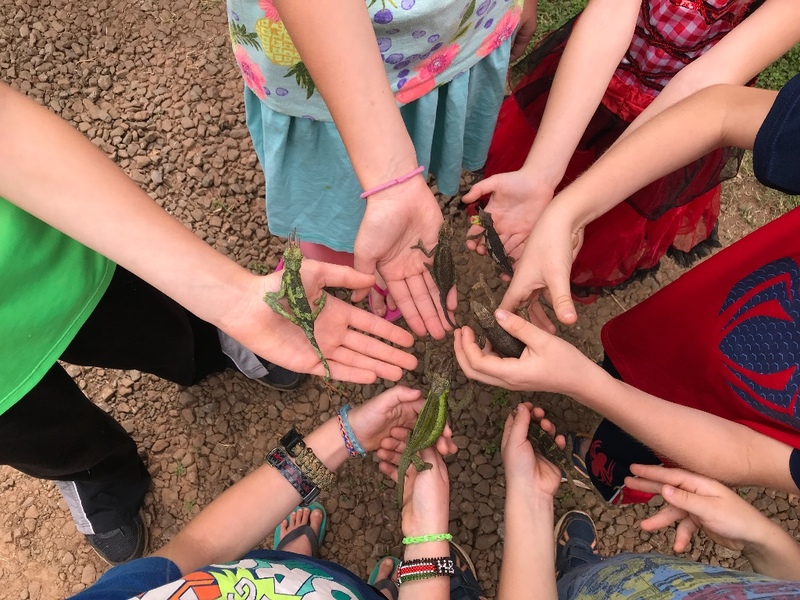 Recently, he helped several of the kids who were playing on the compound to each catch a chameleon and they were all SO happy! They were calling themselves the "Chameleon Club" and they were marching around showing everyone all their chameleons. It was super cute and it just reminded us of how different our life is here. Every kid with a chameleon in their hand...not something you'd see in North Idaho! We've been hard at work over the past several months to give our website a fresh, updated look. 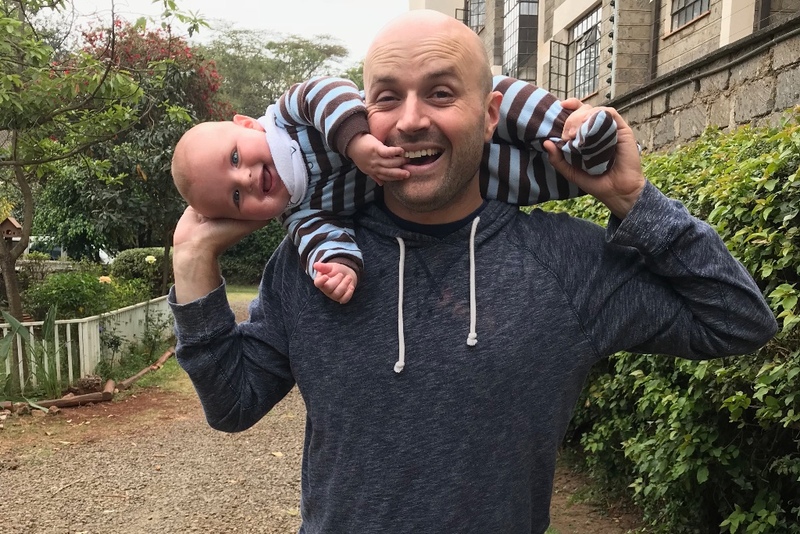 The reason for the revamp was mostly so we could share more of Jordan's photos from his travels and from life here in Kenya, and also to have a better blog setup. This new redesign allows for both of those things. So, if you're looking for more photos from Namibia (or Kenya or Tanzania or Burundi) click HERE. 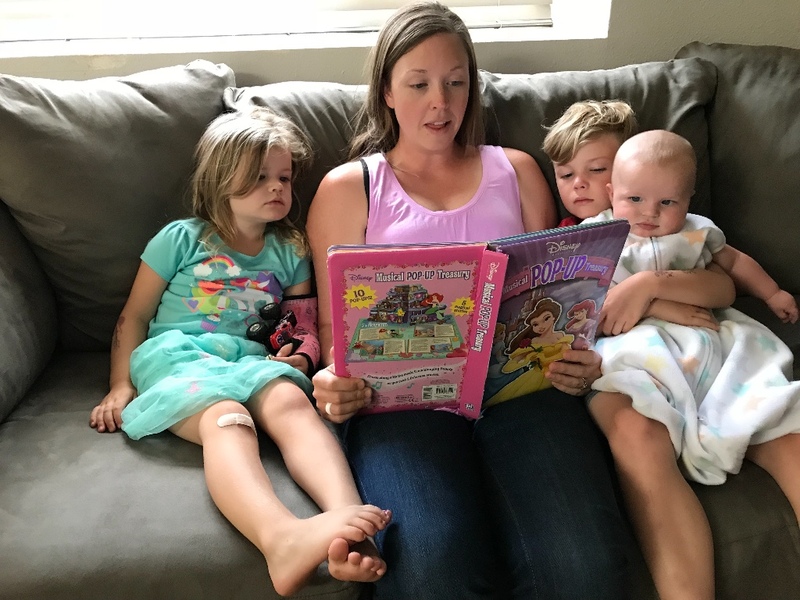 And if you want to read some of Kristin's older blog posts or sign up for new and upcoming blog posts delivered right to your inbox, click HERE. Get ready - this guy's comin' for ya! Our next newsletter will be sent from the States! Ahhhh! It's so crazy we're leaving Nairobi in ONE WEEK to make our way back to Coeur d Alene! We'll stop for a few days to see good friends in Vancouver, BC and then head down through Seattle on Saturday, July 14th. If you're in the area and are able to come meet us, we'd love to see you! We're planning to be at the Lynwood Chick-Fil-A from about noon until 2pm on that Saturday. Seattle friends - meet us at Chick-Fil-A in Lynwood on Saturday, July 14th! For the money that came in towards our plane tickets to get back to Coeur d Alene this summer! Literally, what was so generously given was EXACTLY what we needed! For this new house that is becoming a home. It's so close to where Jordan works, so close to where the kids will be going to school, and so close to where we gather with our church on Sundays! We truly could not ask for more! 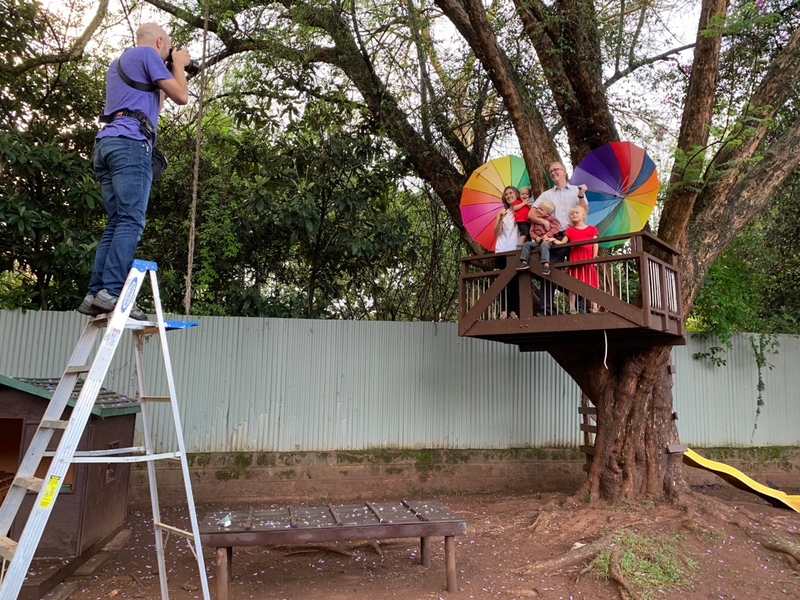 For the Nairobi Waldorf School adding first grade (and a grade every year for the next three years) at their campus that is ten minutes from our new home! What an incredible, unexpected blessing!! For smooth travel back across the ocean (with THREE kids this time ). For a miraculous abundance of time while we're in the States - time to see everyone we love and care about and to connect well and not feel rushed. Also for grace for ourselves as we try to do as much as we can without becoming overwhelmed or overtired. For the funds needed to send our kids to their new school. God's got this. Pray that we can simply trust him in that. For more and more African brothers and sisters to be mobilized to reach those around them who do not yet know Christ, specifically Namibians. The lakes and the mountains will always feel like "home" to us! Webster's dictionary defines being "at home" as being "relaxed and comfortable, at ease; in harmony with the surroundings; on familiar ground." When we think about "home" these days we find ourselves somewhat confused. Paul says in Philippians that our citizenship (our true "home") is in heaven. For us, that passage has become even more real as we now feel like we have two "homes" on earth - Coeur d'Alene and Nairobi (even though neither of them is our "true home"). Coeur d'Alene is the place we will always go back to. It's the place that feels familiar and where we can relax and be comfortable. It's where we grew up, where we brought Zuri home from the hospital and the only place we've ever owned a house. But now Nairobi is home. It's where we live, our place of residence. And we are becoming more and more comfortable here. This is our life now. This is where God has called us. This is our "home" now. This is the place we call "home" now. As part of our ministry with Africa Inland Mission, we are commissioned by our sending church, Anthem, to go and do the work God has called us to. Part of the going includes coming back to the place we were sent out from to report on our ministry. And, believe it or not, the time is fast approaching for us to do that. Some global missionaries stay on the field for two, three or even four years before returning to the place they were sent from. And when they do that, they often return for four months, six months or even one year. Our plan looks a little different. We intend to return annually to reconnect with supporters, report on our ministry, rest and regroup for another term in Kenya. And since our kids will be starting school in September, we need to do that this summer so we can get back for their first day of school. We can't wait to gather together with our Anthem Church Family to celebrate what God is doing! 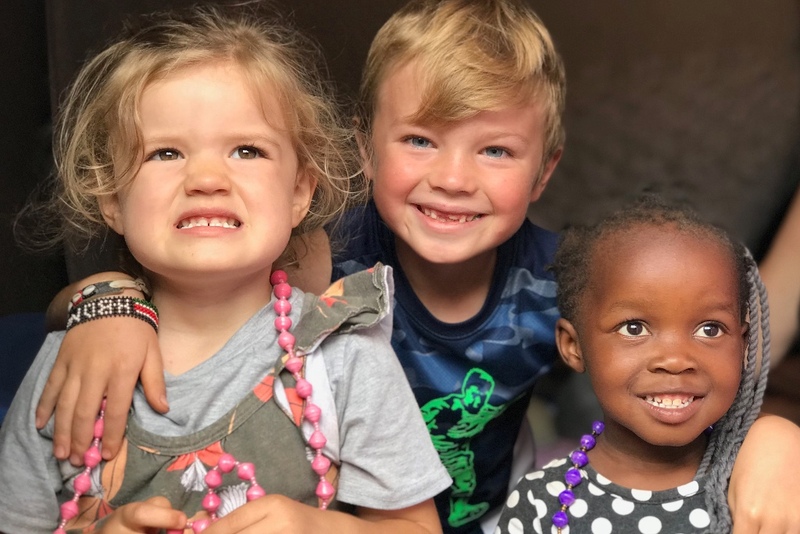 We have reserved our plane tickets and we are looking forward to time in the states with many of you - time as a church family, to report on what the Lord is doing in Africa, and in fellowship encouraging one another. Our tentative dates to be in Coeur d'Alene are July 15th-August 24th. We'll fly into Vancouver, Canada (because it was WAY cheaper than flying into Spokane) and drive down through Seattle on July 14th or 15th (Seattle friends - stay tuned for details on a Seattle get together!). We have been setting aside a percentage of our overall support each month to account for our annual time back in the states, to cover the extra expense of travel back and forth for our family, but this year our plane tickets are more expensive because we had to wait for approval from AIM to travel back annually (which meant reserving our tickets later than we had planned). 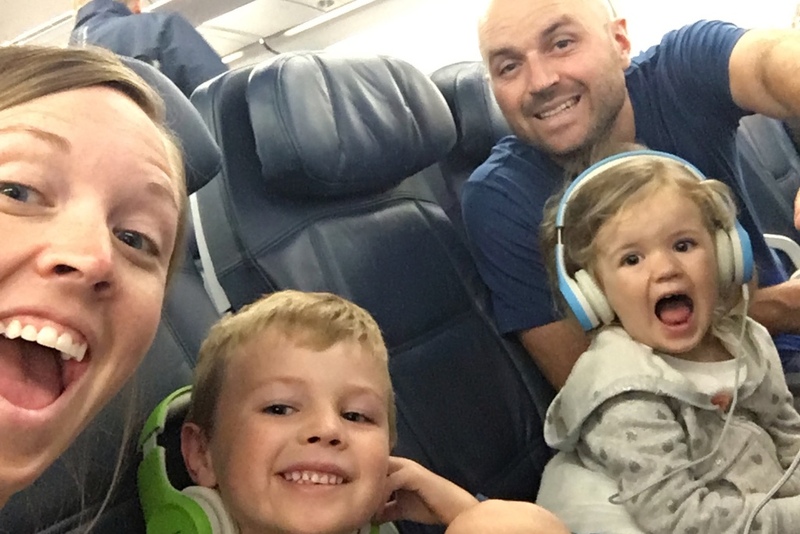 We have $1,000 of the total cost still remaining for our family of five to get back to Idaho to report on our ministry here in Kenya. Would you consider giving to our “Home Assignment” project to help us raise the funds remaining to go? Donate Here. 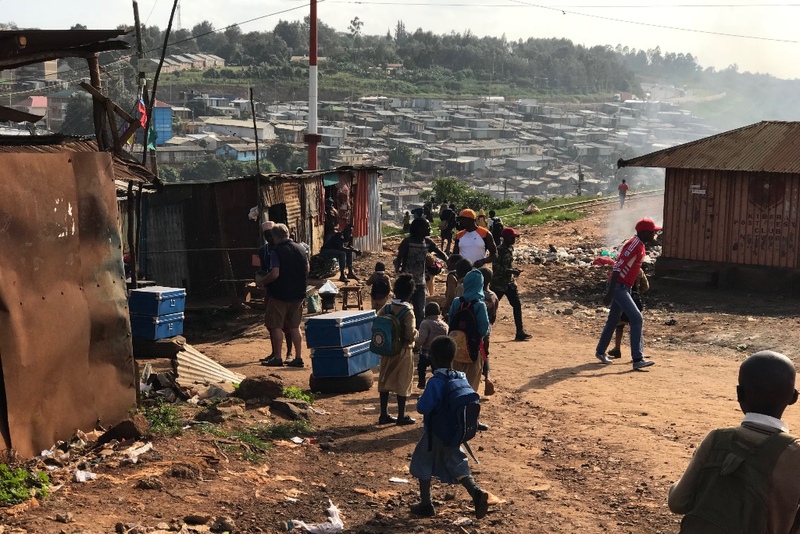 AIM's International Director, Luke Herrin, has written a wonderful article explaining the heart behind this focus on African Mobilization. He says, "I believe that AIM is at a point of a major shift of focus. For most of our history we have been pioneers, doers, people who went into the forests of Congo or the urban deserts of North Africa to bring the gospel to the unreached. And this will certainly continue. But as we go, might we become, more and more, a mission that invites, equips, sends, trains, serves, or encourages African workers to do the same – whether together with our workers or as part of new initiatives and teams? Can our focus shift, from that of mostly doing to include that of mobilizing?" Pastor Joseph, being interviewed here by the On Field Media team, is an African missionary in Garissa, Kenya. On Sunday, July 1st, 2012 three men drove into the Africa Inland Church compound in Garissa. Two of the men alighted from the vehicle and walked towards the police officers who were seated about 20 meters from the church. They shot them dead with pistols at close range. They then took their firearms, two AK47 rifles loaded with 60 rounds of ammunition, and fired several shot in the air — forcing the congregation to rush towards the back door for safety. Then they hurled two grenades into the church and opened fire indiscriminately, killing nine worshippers on the spot. Another three were killed as well, bringing the total death count to 14. Pastor Joseph (pictured above) had felt the call to be a missionary to unreached people groups, and that call had included a move to Garissa (which has a very large population of Somali immigrants and refugees) prior to the Al Shabaab attacks on the AIC Church. He was there that day. His wife was shot in the leg, but somehow he managed to escape unscathed. He and his wife have since returned to Garissa and continue their ministry there. 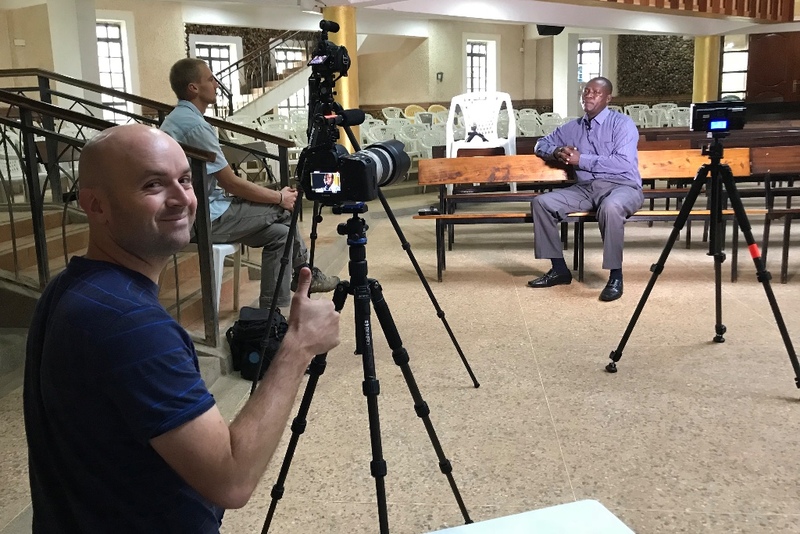 Stay tuned for the video with more of Pastor Joseph's story (which will be used in AIM's efforts to mobilize more Africans for mission). Would you join us in prayer as we seek the Lord in his vision for the people of Namibia? Apparently Prince Harry and Meghan Markle are rumored to have chosen Namibia as their honeymoon destination, but that's neither here nor there; and since they've delayed their honeymoon, we'll all just have to wait and see anyway. 🤷🏼‍♀️ But the real reason we're writing about Namibia is because Jordan is traveling there next week for ten days with AIM's Southern Region Executive Officers and Unit Leaders to explore the possibility of new work there. As the trip is very much exploratory for AIM's Southern Region, would you join us in praying that the Lord would lead us; and if this is where he would have us go that we would be obedient, but if it is not in his plan at this time that we would be open to that as well? We'll have more to report next month, but for now prayers are so appreciated! 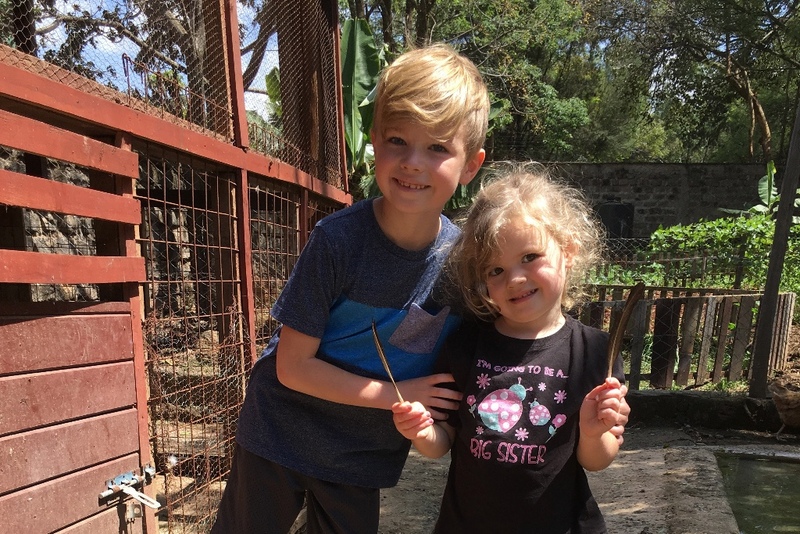 Jordan has never seen a cheetah in the wild, and they're his favorite animal, so he's really hoping to catch a glimpse of one! There's a lot of space. Namibia is one of the least crowded destinations on the planet. Only Greenland, the Falkland Islands, Mongolia and Western Sahara (in that order) have fewer people per square kilometer. Nearly half of the country is protected. Namibia takes conservation seriously. In fact, more than 40 percent of the country is under conservation management. It's the only African country with a female leader. Namibia elected its first female leader in 2015. Saara Kuugongelwa is the country’s fourth prime minister and the only female leader on the continent at the moment. 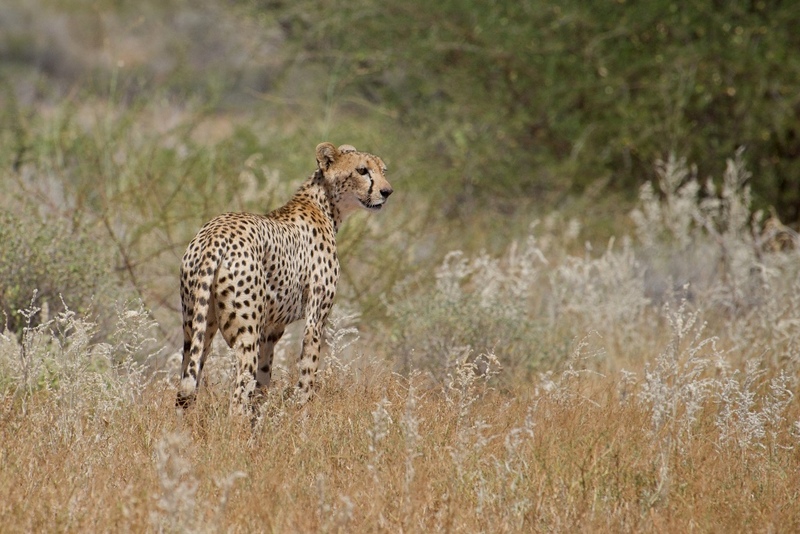 More cheetahs live in Namibia than anywhere else. Namibia is home to the world’s largest population of free-roaming cheetahs. It has Hollywood connections. Namibia’s dramatic landscapes, which range from desolate deserts to shimmering salt pans, have been used as the backdrop for numerous big budget blockbusters including most recently Mad Max: Fury Road. For the ways He is working all over this planet. For allowing us to really feel that heaven is our true "home." He has uprooted us from our "home" in the States and moved us to another "home" which often still doesn't feel like home. But through it all we are learning more and more to press into Him and seek Him for comfort, instead of seeking the things of this world. For the Holy Spirit moving among Africans to reach their fellow African unbelievers - He IS TRULY ON THE MOVE! For provision for the added expense of travel this summer back to the States to report on our ministry, to rest, and to regroup for another term in Kenya. 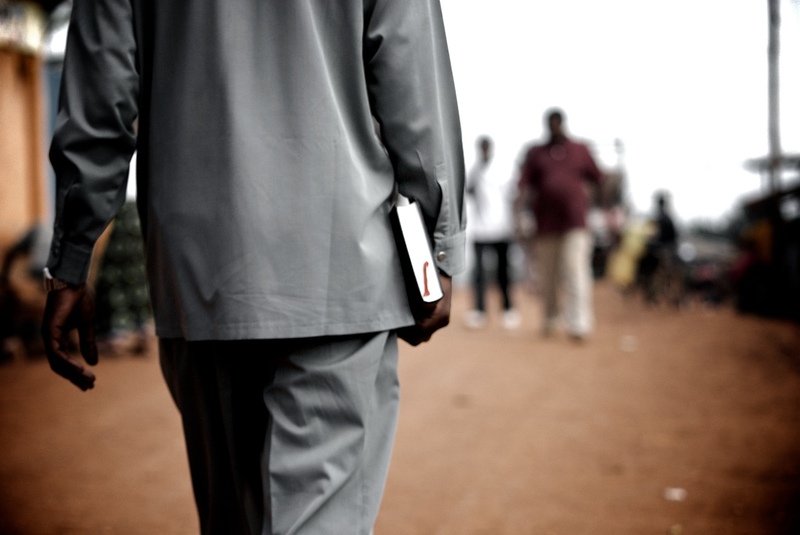 For more and more African brothers and sisters to be mobilized to reach those around them who do not yet know Christ. For His will with Namibia and the upcoming travel for Jordan and the team, as well as for patience and endurance for Kristin as she cares for all three kids alone for ten days. Mateo Paul Andre made his way into the world on March 23rd at 4:06pm local Nairobi time. Weighing in at 9lbs 3 oz and 21 inches, he is our biggest baby by far! The story of Mateo's birth is certainly one worth sharing. It begins on Wednesday evening, March 21st. No, I wasn't in labor that long! But we had a pretty epic dance party at home that evening with Moses and Zuri and Jordan's parents! 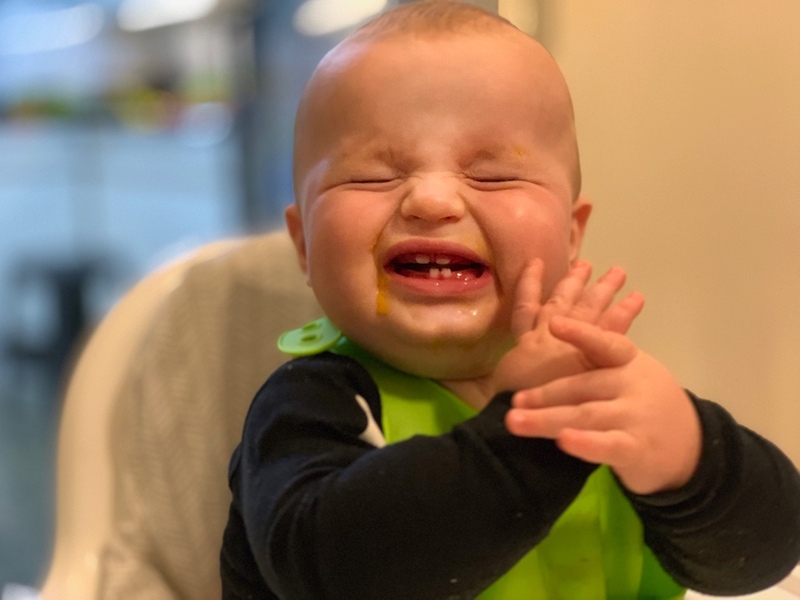 I did everything in my power to dance the baby out (see pic below) and was literally trying my hardest to break my water (as smart or not smart as that may have been). Well, I didn't get the epic water-breaking moment some women experience (and that you most often see in movies or on TV), but my water did break that night and the entire next day, Thursday, I experienced what felt like me peeing my pants all day. Super weird. But no contractions. It was very disappointing, and I knew if I didn't start contracting ASAP I would have to be admitted to the hospital and we'd have to begin the interventions (aka - Pitocin, my dreaded enemy). So that evening I took a hot shower and literally cried out to God in anger about how this was not the redeeming story I was hoping and praying for. Not the redeeming story so many others were praying for on my behalf. I hate to admit it, but I was actually quite mad at God. He could have intervened, he could have changed the scenario. But he didn't. He didn't. And I was mad. Yes, they all put pillows in their shirts so I wasn't the only preggo dancing! That night (Thursday night) nothing happened. I didn't start contracting and my water didn't do anything different. So, the next morning, Friday the 23rd, we headed to the hospital to get things going. Thankfully, I had an amazing doctor who started out by rupturing my water the rest of the way. Apparently, there are two membranes in the bag of waters surrounding the baby and I had just barely ruptured one of them. So he ruptured the other one and then I had that "gushing" moment. Well, let's be honest, it lasted longer than a moment. But after that, I was allowed to walk around to see if contractions would start. If you know my story with Zuri, you know how familiar that was for me. Contractions never started with her, so I had to start Pitocin. I figured that would be what would happen again this time, but God, in his mercy, had a different plan this time around. Contractions started! And they got more and more painful and closer together! How happy I was to be feeling the pain! So weird to even write that, especially now being on the other side of ALL. THE. PAIN. First picture as a family of FIVE! I was hoping to have a water birth, and the hospital where I was birthing had one birthing tub, so it was a possibility, but the birthing tub was in another wing from where I was laboring and (long story short) I went from 6cm dilated to 10cm dilated so quickly that there was no way to move me from my labor room to the room with the birthing tub. 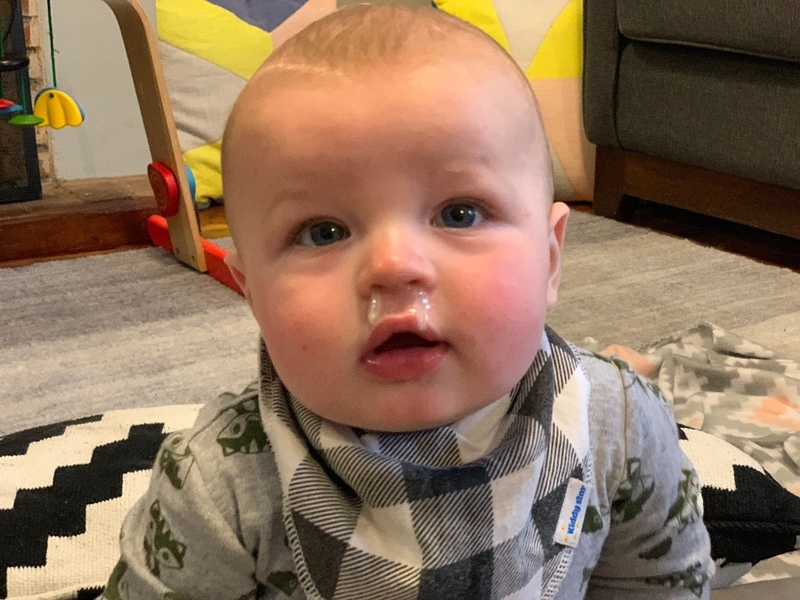 So, while I'm a little disappointed that I didn't get to try that this time around, I am so thankful to report that I was able to bring this big baby into the world without Pitocin (Praise the Lord 🏼) and without any other interventions or drugs. It took me about 45 minutes to push him out, thanks to him turning his big head sideways (and causing me SO much pain!) but he arrived safely at 4:06pm and I was SO thankful to have him out!! We didn't know if he was a boy or a girl. and we hadn't settled on a name, so later that night, as I looked back on the day's events and all that had happened, I repented for my anger and unbelief and I felt so clearly that he was to be named Mateo, which means "Gift from God." He truly is God's gift to us - in the form of a healthy pregnancy, a safe delivery in Kenya and a redeeming birth story! 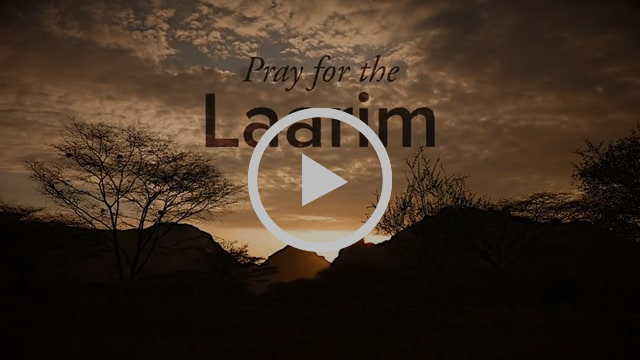 Join us in praying for the Laarim of South Sudan. The Laarim practice Africa Traditional Religion with some Catholic influence. They are highly aware of spiritual forces, and believe in a supreme being who controls all of life, including the health of their cattle. They believe spirits of their departed ones roam the earth and they can communicate with them through prayers and offerings which they perform collectively in designated ritual places. Also known as the Boya or Narim, the Laarim live in the Boya Hills of South Sudan. It’s a rugged and hilly terrain with rich savanna, high grasslands and scrub bushes. They live in small settlements. Social and cultural life is centered around cattle, with livestock being their only known natural resource. They breed them, eat their meat, use them as dowry to get a bride, drink their blood and milk, and sleep on their hides. The culture is patrilineal, with strong ties of community solidarity. Initiation rituals are followed for passing into adulthood, and dowries are paid for brides. Zuri and Moses with their new friend Mitchel (pronounced Michelle). 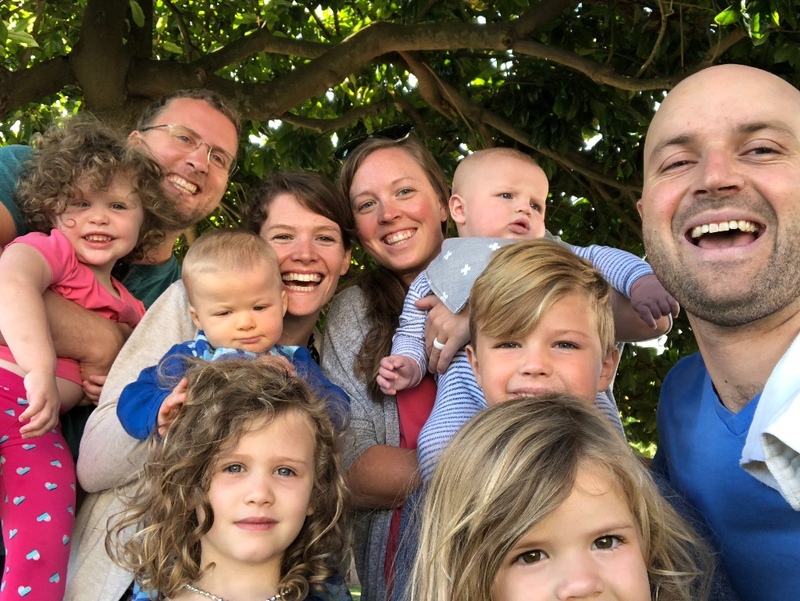 In other news, just days after Mateo was born, Jordan and our kids went with Jordan's parents to Kibera to visit our friend Rose and her family (Mitchel pictured with our kids above is Rose's granddaughter). 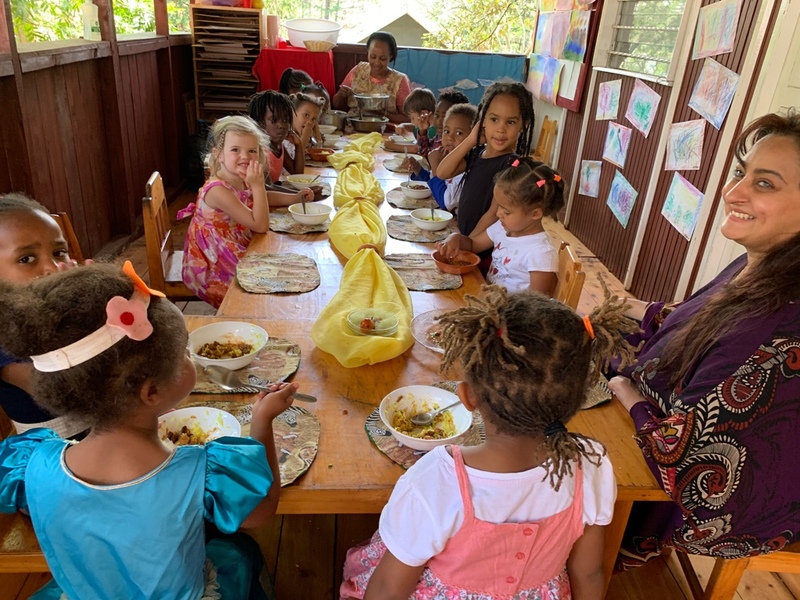 They all shared a delicious traditional Kenyan meal prepared by Rose at her house, and our kids had so much fun - they came home full of excitement and joy at all the newfound friends they made and the new place they got to visit! They didn't even notice the poverty all around them. They just made friends. And played. For hours. It constantly amazes us how kids are kids wherever we go. They don't see what we see and it's truly an incredible thing. Perhaps that's why Jesus told us all to never lose our childlike hearts? A view of part of Kibera from nearby Rose's house. This photo doesn't do it justice in terms of its massive size. We've shared about Kibera before. Unofficially, it is the largest urban slum in Africa, but no one really knows how many people live there. Estimates vary widely, from 150,000 to 1.5 million. Probably the best guess is a "density" survey made from aerial photographs which put the number around 800,000. Zuri playing at our friend Rose's house. 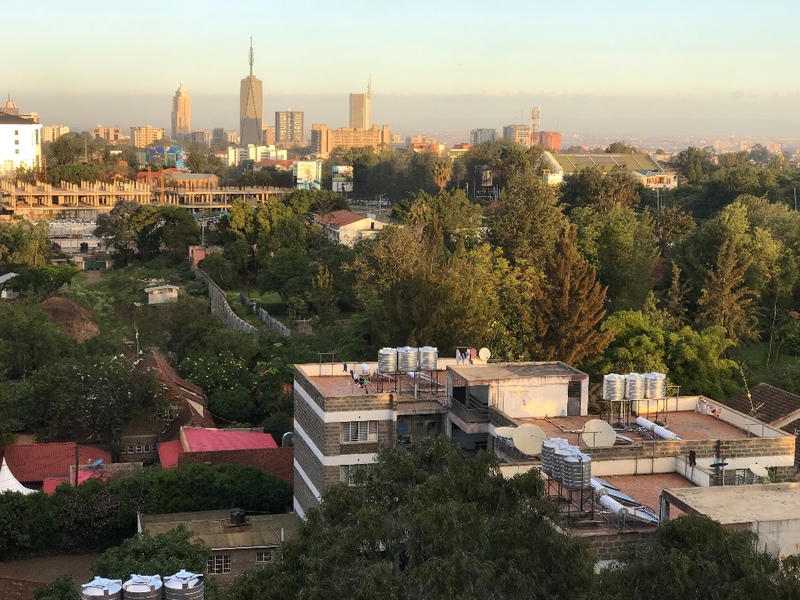 Now that we live in Nairobi, just a short walk from one of the entrances to Kibera, and have friends who live in Kibera, it is no longer just a place we read about. Or a place we share statistics about. It's a place our friends call home. It's a place our kids friends, like Mitchel, call home. It's real to us. And that changes how we talk and pray about it. It is still a destitute place, but there's such beauty in the midst of it all and our friends who live there are beautiful; wonderfully made in God's image. Just like all of us. We celebrated our first Easter in Africa, while Jordan's parents were still here! Mateo was sleeping, so this is the best family photo we could get. Easter fell just a little over a week after Mateo was born, so it looked a little different for us than it would have if he were a bit older. But Jordan and the kids and Jordan's parents were able to celebrate with our church family and we all shared a delicious Lebanese meal that evening. The above photo is at the Lebanese restaurant. 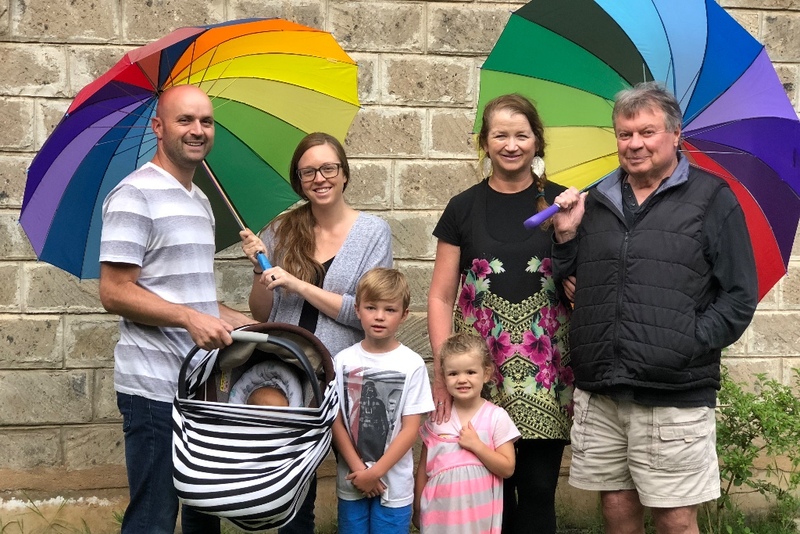 We've had lots of rain in Nairobi this past month, hence the [super colorful] big umbrellas. 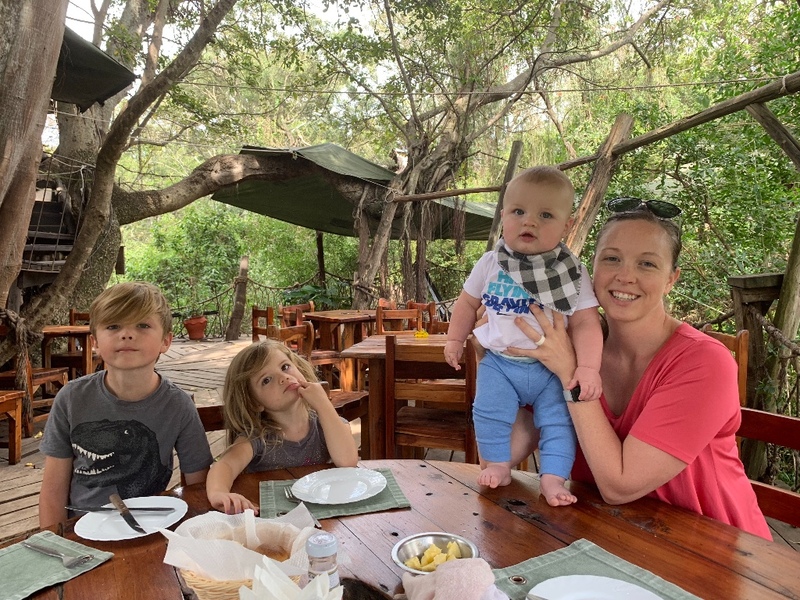 The kids, Jordan and Jordan's parents also got the opportunity to go on safari at Nairobi National Park this past month. Click HERE to view all the photos. Just a few miles from our home is a wonderful game park filled with so much African wildlife. The kids were so excited to go on their first real African safari! 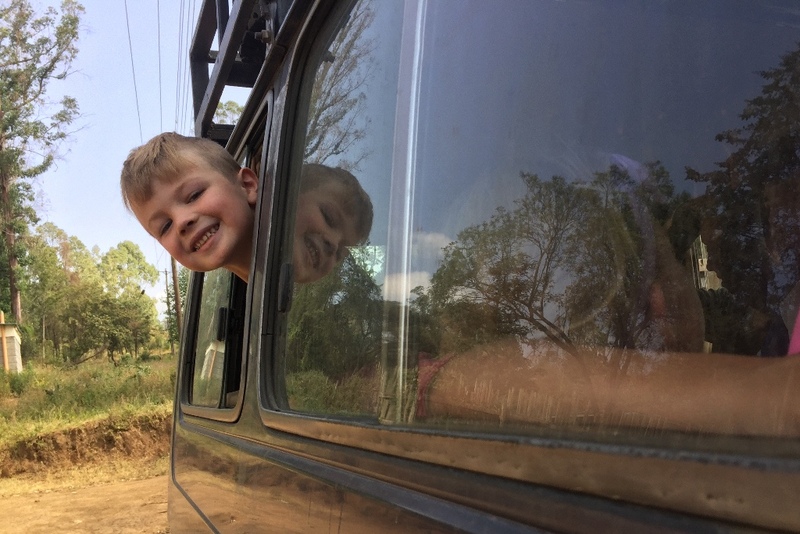 They saw zebras, rhinos, hippos, monkeys, giraffes, wildebeests, lots of birds, and lots of smaller animals as well. Click the picture above to view Jordan's full gallery from their eleven-hour game drive! Wow. What a crazy month it has been! Obviously, with the addition of Mateo to our family, we have been in a constant state of adjustment. It's always crazy adding a new member to the family and newborns require so much at first. 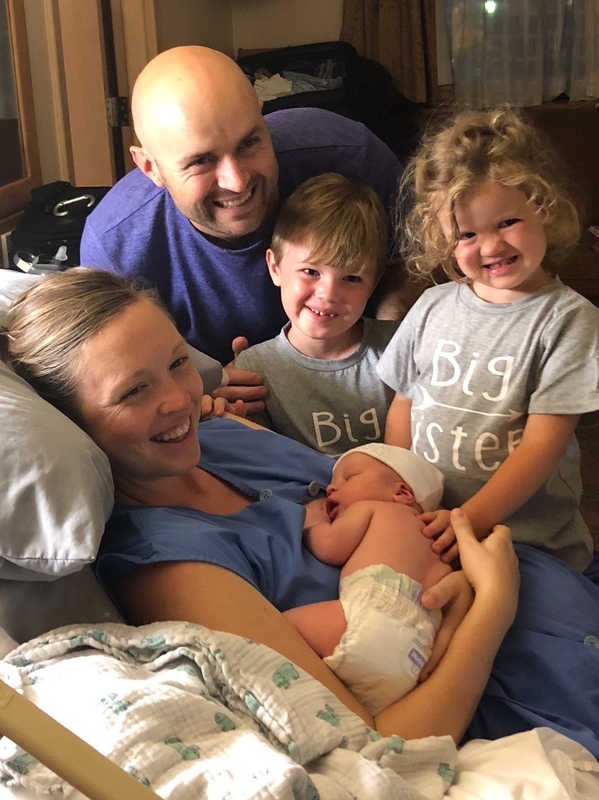 Would you continue to pray for us as we adjust to life as a family of five? We're doing well overall, but we're tired. So prayers for strength and endurance are greatly appreciated! Also, would you join us in praying this month for the Laarim of South Sudan? We praise God for Napir's baptism last Sunday! 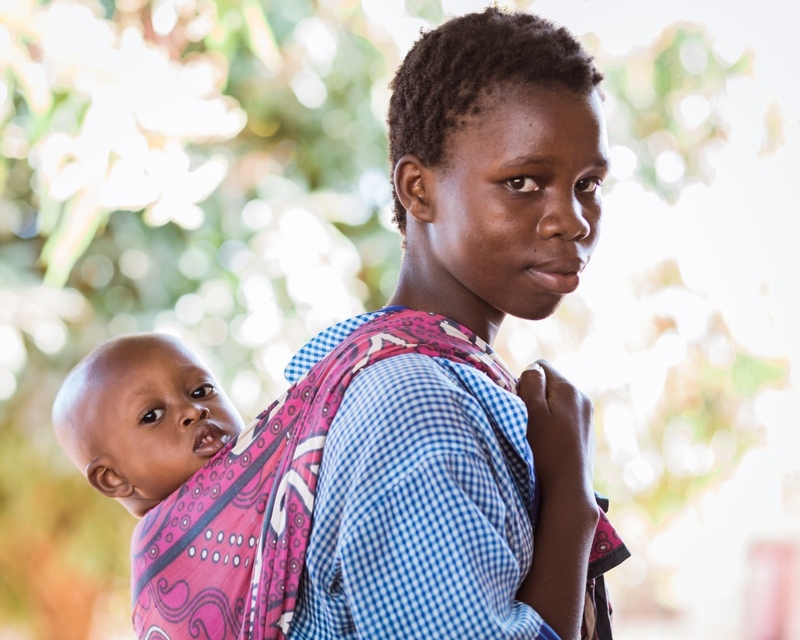 Pray that in her early steps of faith she would be protected from the enemy's attack and that our AIM teammates would continue to be able to teach and encourage her. Pray that this would be a great witness of personal faith and acceptance of Jesus to those around her. And also pray for God to send more workers into this harvest! 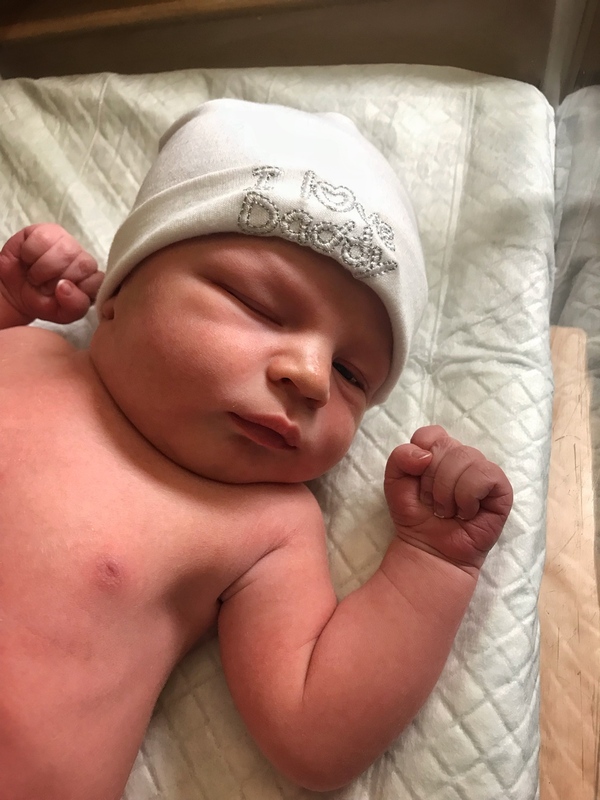 BABY BOY ANDRE HAS ARRIVED! 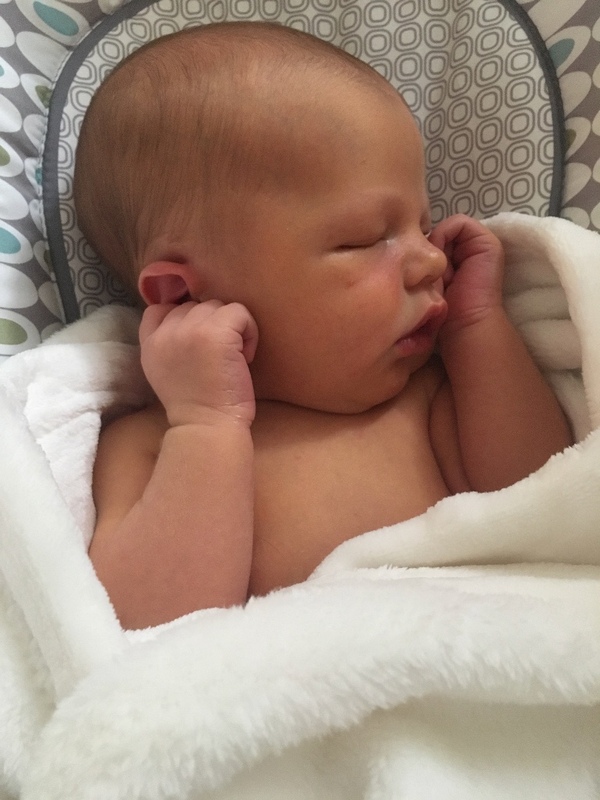 We could not be more thrilled to announce the arrival of our newest little addition : A BOY!! In Hebrew, Mateo means Gift of God and that’s just what he is - God’s gift to us! He arrived at 4:06pm local Nairobi time on Friday, March 23rd. Measuring 21inches and weighing in at a whopping 9lbs 3oz! The story of his arrival is coming, but for now, we wanted to send a quick update to let you all know of his safe arrival. Mommy and baby are doing well and we are so thankful for this incredible little blessing from the Lord! A Digo girl carrying a baby. We're pretty sure this is the original inspiration for the Ergo Baby carrier! Jordan has just returned from a quick trip to the Kenya Coast to learn more about AIM's efforts among the Digo people. The Digo (pronounced dee-go) are an Unreached People Group of about 500,000 living in Southeast Kenya and Northeast Tanzania. Historians disagree as to whether the Digo migrated to their current location from Somalia or Southern Africa. Originally they settled deep within sacred forests in order to worship ancestral spirits and to be safe from warring tribes. Islamic traders visited the coast of Africa as early as the 10th century and had contact with the Digo. During the 19th and early 20th centuries, the Digo experienced a time of great famine. It became a common practice for them to give either themselves or their children as kore, or "blood money," to serve as temporary collateral for a loan of food. Sadly, there were many times when the debt could not be redeemed, thus leaving them to live as slaves. Many of the Digo who were brought to Mombasa as slaves later obtained their freedom by converting to Islam. Ties with traditional practices (such as animism, the belief that non-human objects have spirits, and ancestor worship, the practice of praying to deceased ancestors for help and guidance) still have more influence on the Digo community than does Islam. One example of spiritism is their use of blood sacrifices. Such sacrifices are very significant to the Dido, especially in the exorcism of evil spirits. Witchdoctors are also consulted regularly. 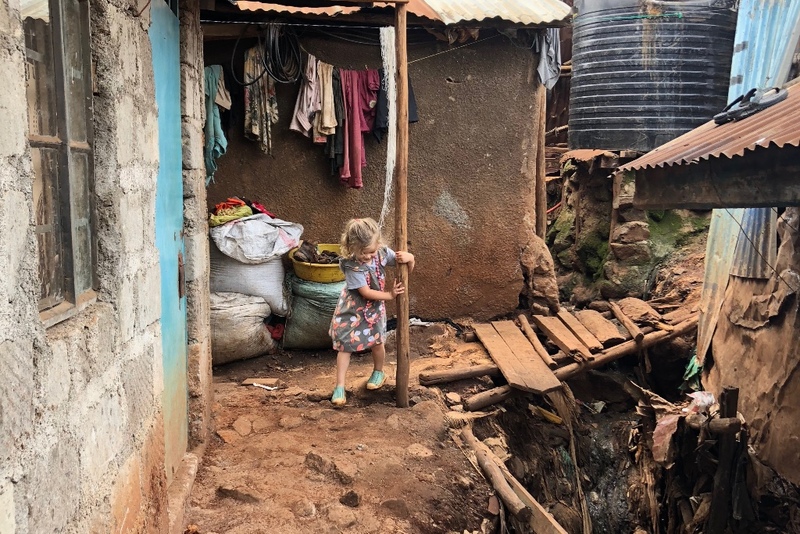 Will you join us in praying for the hundreds of thousands of Digo people who have yet to find freedom in Christ and for our co-laborers who are living and loving the Digo on the Kenyan Coast? Our official "due date" is March 18th, but this mama is READY! We are having a baby THIS month!!! We've been waiting nine looooonnnng months to say those words, but the time has finally come! We will actually get to meet this kid this month and we couldn't be more excited! It's all a bit surreal still, being on the verge of our family changing so drastically by going from two to three kids. But we think we're ready. As ready as we'll ever be! 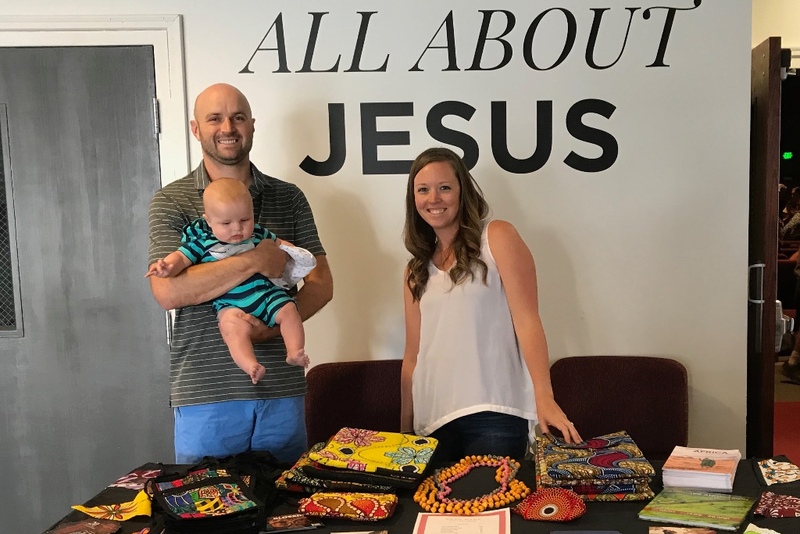 Thanks to the incredible Women's Bible Study Groups at Anthem Church and quite a few others (friends, family, etc), we have been completely and overwhelmingly blessed with nearly everything off our Baby Registry! What an incredible blessing!! Jordan's parents have just arrived with all the goods and we feel so loved!! Jordan's mom is a labor and delivery nurse, so we've been hoping and praying this kid would wait to come until she gets here. Now that she's here, those prayers have turned to "c'mon baby"! 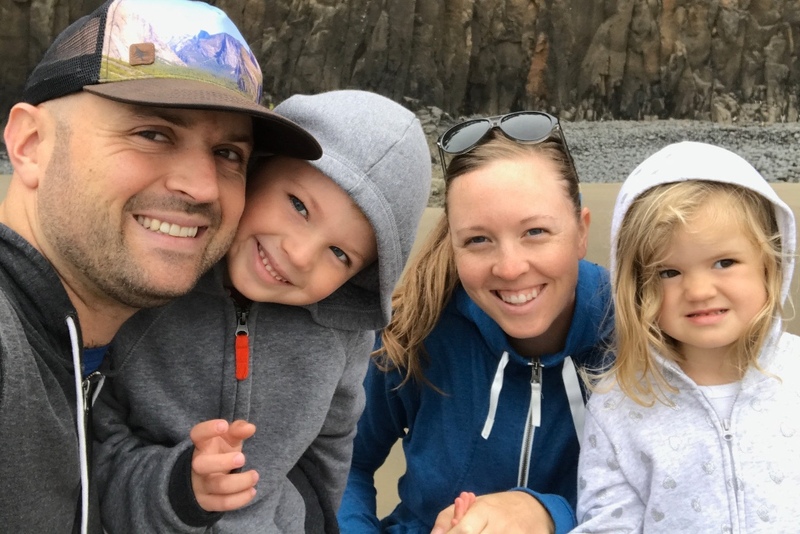 With both our other two kids Kristin had to be induced because it got to be too late and wasn't really safe to keep waiting, so would you pray that she actually goes into labor on her own this time around? That would be such an incredible blessing! Dance Party with SO MANY KIDS from our neighborhood in our front driveway/courtyard area! We have tons of kids right around Moses' and Zuri's age in our neighborhood! They are constantly coming knocking at our gate after they get home from school and on the weekends. One particular Sunday afternoon there were seriously around 20 kids who wanted to play, so Jordan brought our speaker out to the front of our house and played DJ. He took requests for kid songs and the favorite (by far!) was the song from Frozen! They requested that one over and over and over again - and they ALL knew the words to the chorus. It was hilarious to watch them all dance and listen to them all sing at the top of their lungs! When it was time for our kids to come in for dinner (we eat MUCH earlier than most Kenyan families who eat dinner around 8pm) there was much whining and sadness and none of the kids (ours included) wanted it to end! I have a feeling this will become a regular weekend activity around here!! Have you ever heard how much Jordan LOVES baby goats?! Ok, seriously. Jordan has this intense love for baby goats. When he sees one, he literally HAS to pick it up and he gets this big, goofy grin 🏼 on his face. He will run around chasing a baby goat until he catches it. It's amazing. And hilarious. And I'm sure you think I'm joking, but I'm not. He really, really, really loves baby goats. 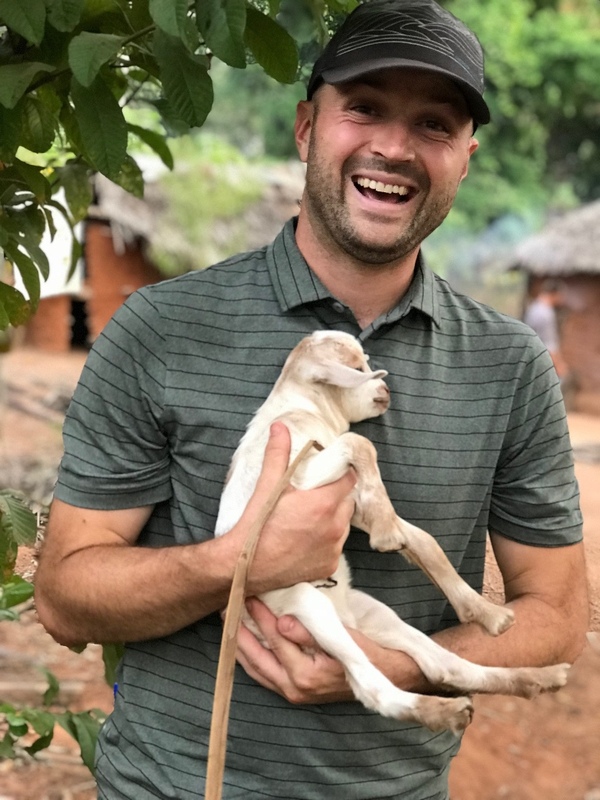 This particular goat was brand new, born just hours before Jordan held it and it was a much needed source of joy after the team finished a mentally taxing and spiritually draining walk through the Digo sacrificial holy grounds in Kwale. 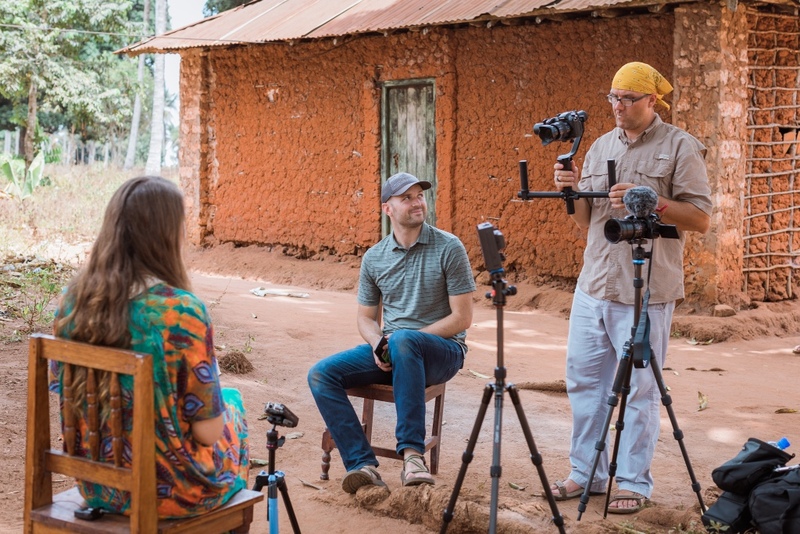 Here's a behind the scenes look at Jordan and Shaggy (one of our OFM teammates) capturing an interview with one of AIM's missionaries among the Digo. This month is a really big month for us. Our lives are about to change forever as we add another new little life to our family. Would you pray for this baby to come on its own, for Kristin to go into labor spontaneously without intervention? Also, prayers for her to produce enough milk to fully feed the baby would be HUGE. 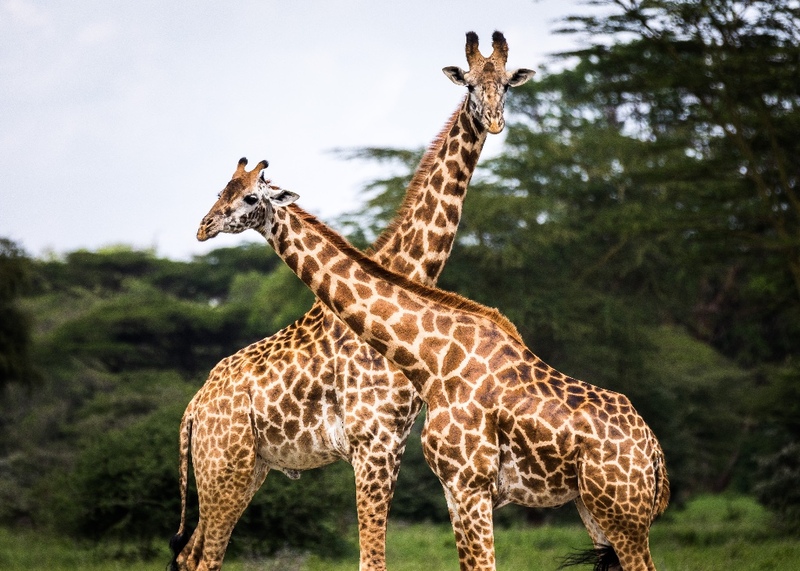 Many of you might not know, but after Zuri was born we discovered that during pregnancy Kristin's body does not produce enough of the glands that produce the milk to feed the baby after delivery. The condition is known as Insufficient Glandular Tissue (IGT). It can get better with each pregnancy, so we are praying that with this third baby there will miraculously be more than enough milk! Other than that, would you pray for our other two kids, Moses and Zuri, as they adjust to another sibling? Both of them are SO excited for the baby to be here, but it is always an adjustment, especially as Kristin will be so sleep deprived for a while and will be very consumed with the baby and the baby's needs. 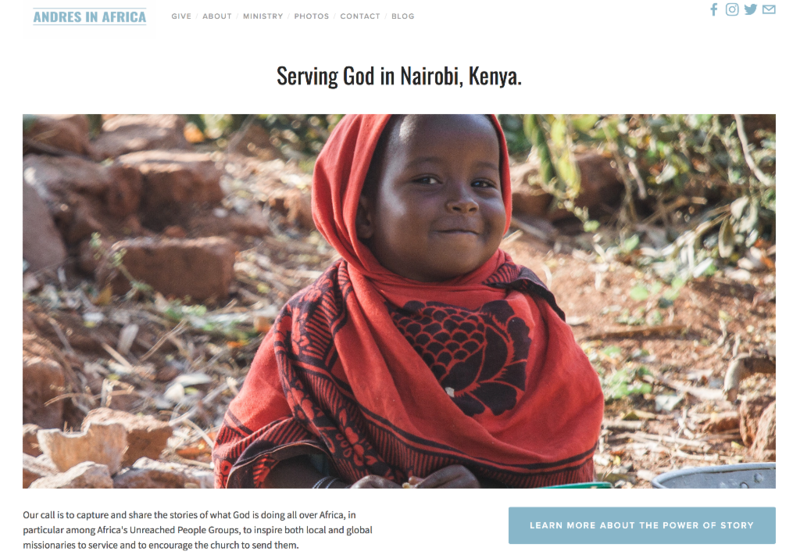 Lastly, would you join us in praying this month for the Digo people of Coastal Kenya - that they would come to know the freedom only found in Christ? Kristin (and baby) and Zuri hanging out by the (unheated) pool at the little hotel where we stayed for our training and orientation. We spent most of January in a little town called Nakuru, which is about three hours north of Nairobi, in a little African hotel for AIM's Africa Based Orientation. 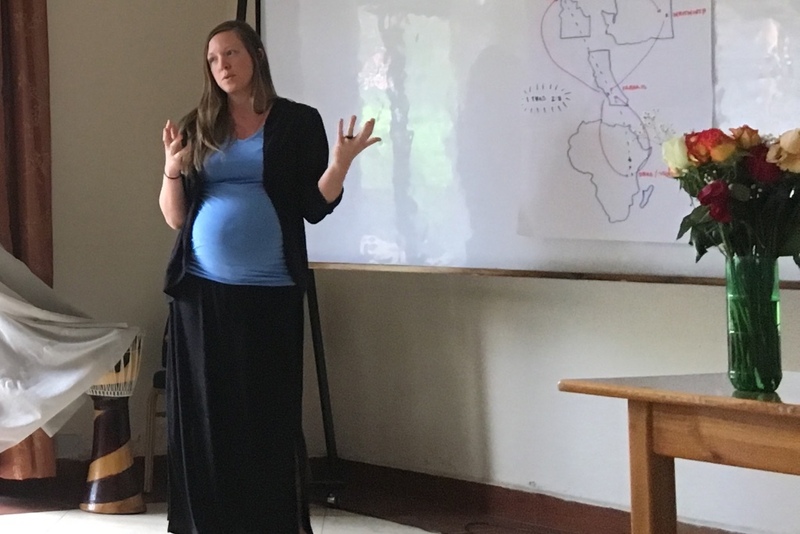 We joined about 20 other new AIM missionaries who are serving all over Africa to learn more about African culture and worldview, spiritual warfare, ethnomusicology, and how to be intentional with things like language learning in hopes of developing real relationships and sharing the gospel. It was such a sweet time of connecting with other AIM missionaries and hearing what God is doing all over Africa. 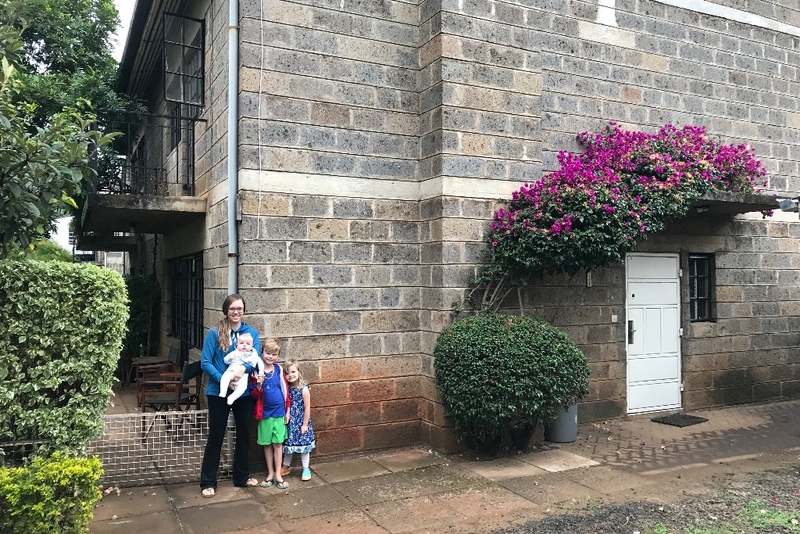 We shared a tiny little hotel room with our kids for three weeks straight, so by the time the training and orientation was over and we were headed home to Nairobi (just a few days ago), we were excited to be sleeping in our own beds again. But even still, it was a wonderful time! Kristin sharing her story of how God got us to Africa. Check out that baby belly! Is this little one a BOY or a GIRL?! We are so excited to find out and meet him or her NEXT month! Overall, this pregnancy has been really amazing. Kristin is admittedly very ready to meet the baby and to be done carrying around that belly all day every day. But truthfully, we are both so thankful for her health and the baby's health thus far. We are also extremely excited and thankful that both sets of our kids grandparents are coming out to visit around the time this little one is due to arrive. Jordan's parents are coming first. They leave early March and will stay for just over three weeks. We're hoping for them to be here for the birth of the baby. 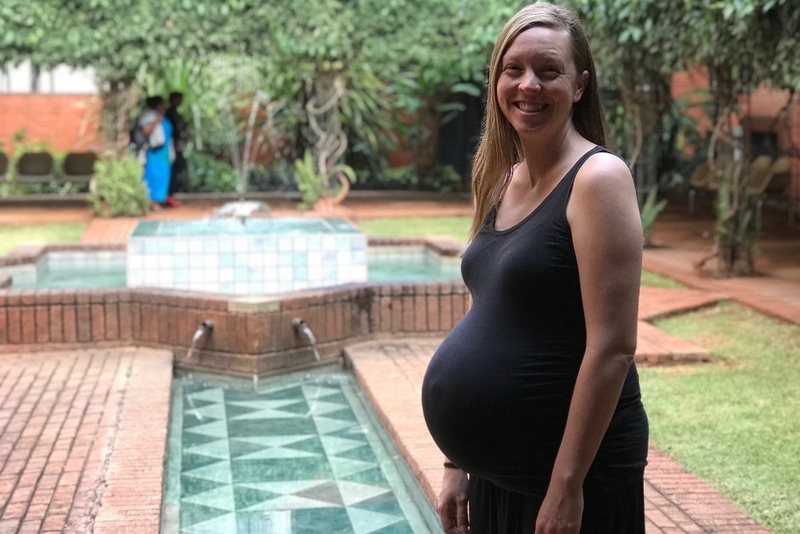 Jordan's mom is a labor and delivery nurse and has been such a huge help in each of our other two births, so we're really hopeful she can be here for this one in Africa too! And while we're all at the hospital, the plan is for Jordan's dad to stay back to hang with Moses and Zuri. Please be praying for that all to work out! Even though this is our third kid, we are basically starting over in the baby gear department. Truth be told - we got rid of most of our baby things in preparation for our big move out here, long before we knew of God's plan with this third baby. So, while we certainly don't need ALL THE THINGS, there are some very practical things we do need that we cannot get here. 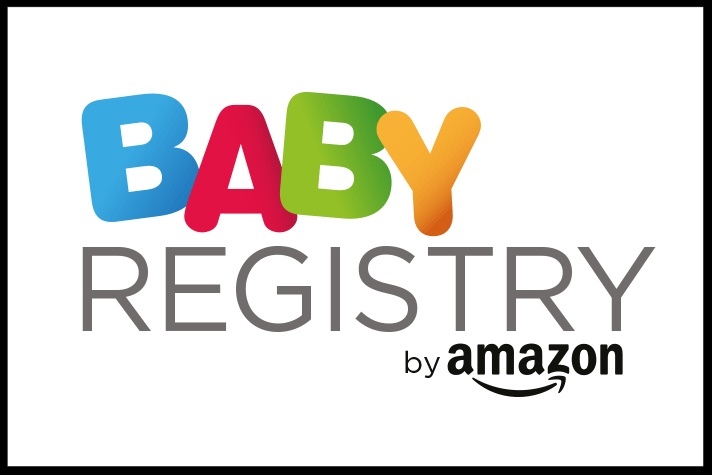 We figured the easiest way to let people know what we need was by creating a registry on Amazon. So that's what we've done. We certainly don't need everything to be brand new, so if you have some of this stuff and are looking for a good second-hand home for it, we'll gladly take gently used things! As we mentioned, Jordan's parents are coming here March 6th and they're happy to bring baby things out with them! If you're a part of Anthem, Sandy Wild is collecting things so feel free to get them to her by February 20th. If you live out of the Coeur d'Alene area, you can just send things to Jordan's parents: Steve & Stephanie Andre, 4420 E Dodd Rd. Hayden, ID 83835 (that's the address Amazon will automatically send things to if you purchase from the registry). A HUGE thanks to everyone who's able to bless us in this way! It means SO much to us!! Moses scoping out the area on the way to hike a crater outside Nakuru, Kenya. Since arriving back in Nairobi, we have been praying through what it's going to look like moving forward with school for Moses and Zuri. 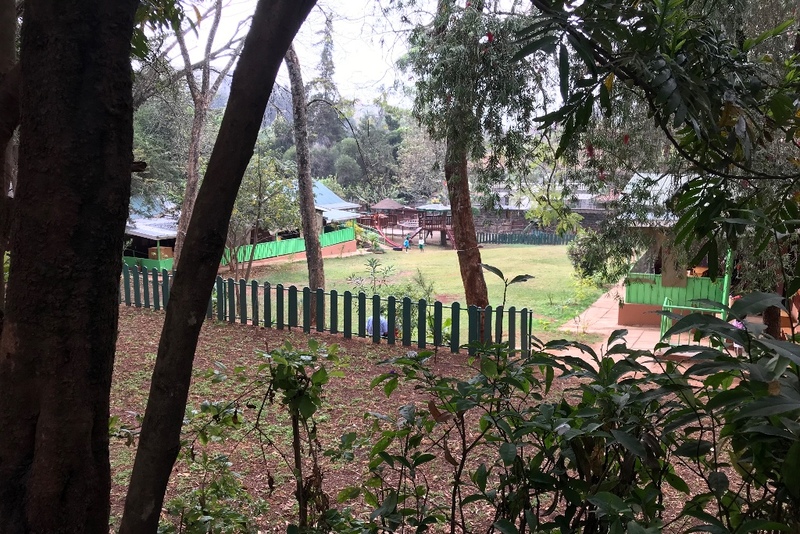 A few months ago, we went and visited the Nairobi Waldorf School and it was further confirmation this was the school for our kiddos. A challenge at this point is that we currently live about 30 minutes from the school without traffic (which can add minutes or hours to the commute). We are praying and asking God about the possibility of living closer to the school, if that is where he would have Moses and Zuri. If so, we pray that He would make that clear and provide a place for us to move to that is within our budget. The Nairobi rental market runs the gamut, and often affordable housing options take a long time to find. 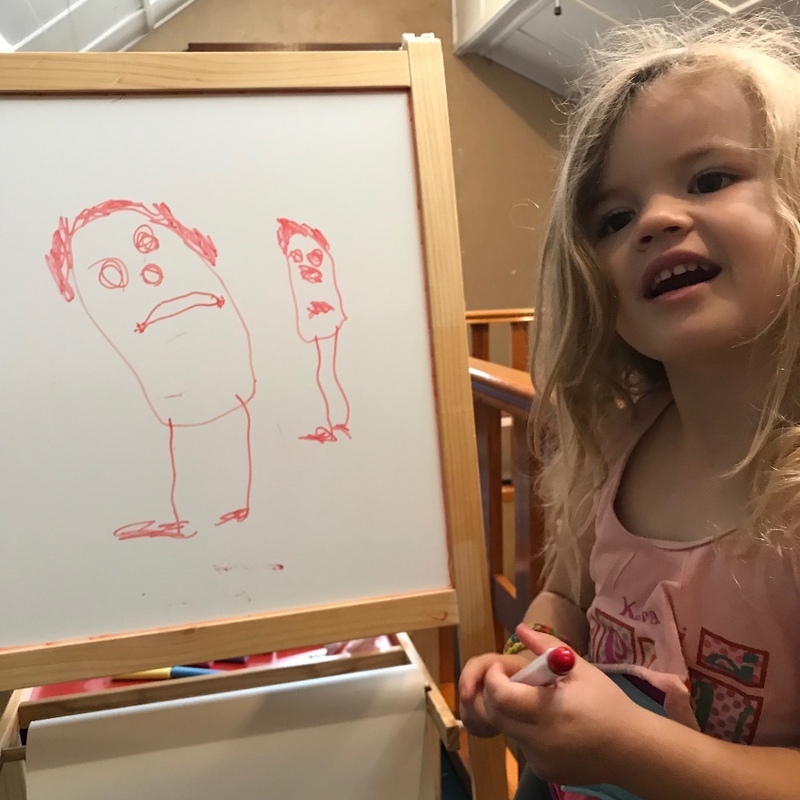 But this school is not a Christian school and we see it as a huge potential ministry opportunity for our entire family, so we are trusting God to handle all those details. Would you join us in prayer for this big decision? 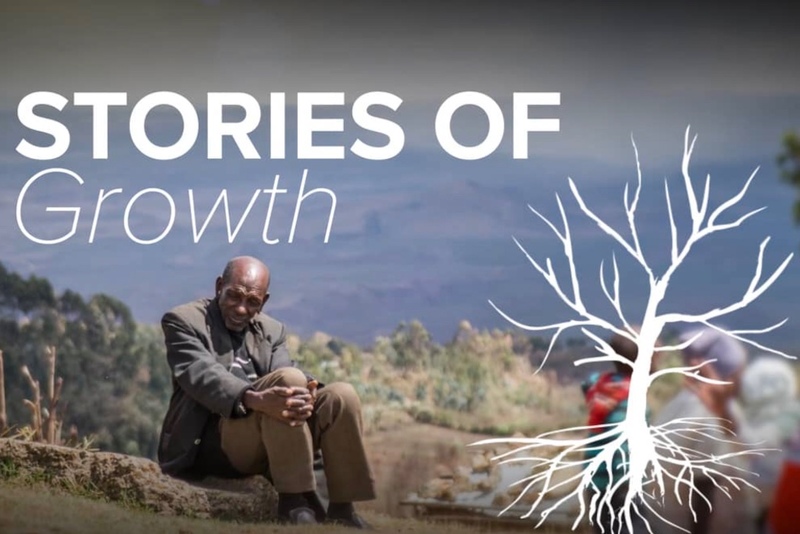 Watch the VIDEO that celebrates 25 years of ministry with the Dorobo of Kenya. 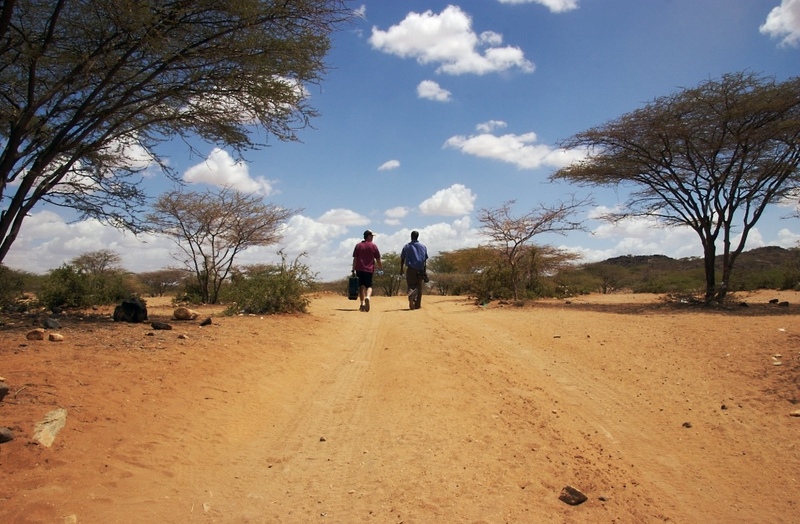 Africa Inland Mission’s ministry among the Dorobo of central Kenya began in 1991. For their entire first year, a team of AIM missionaries simply spent time with the Dorobo by living among them, learning their customs, practicing their language, and building long-lasting friendships. Now, more than 25 years later, after accepting Christ and being baptized, several Dorobo men have attended discipleship training courses or Bible colleges. They go on outreach projects together and teach at pastor’s conferences. The Dorobo have found self-worth, acceptance, and salvation through Jesus Christ, and it is that message that inspires them to bring the Good News to their Dorobo neighbors on the next ridge. God has given Dorobo believers new life and is inspiring them to become missionaries to their own people. Join us in praising God for this incredible transformation and in praying for their continued growth and faithfulness. Watch the inspiring Dorobo story HERE. Produced by the media team Jordan is on. A sincere THANK YOU to everyone who sent Christmas Cards!! In one of our past newsletters we made an appeal for Christmas Cards. Oh my goodness, so many of them arrived while we were in Nakuru in January! What a huge blessing to come home to a giant pile of cards from friends and family! It's so good to get to see your faces and some of your growing families! Thank you to everyone who sent a card - our kids (and us adults) absolutely love looking at all the fun pictures! Thank you for remembering us!! Only you know the way these next few months will play out. We are waiting in hopeful anticipation for this precious little baby to arrive, and of course, we ask for a smooth delivery that results in a healthy mama and a healthy baby. We also ask that Kristin would go into labor on her own, that her body would do that this time since that has not happened yet for her with either of our other two babies. Also, practically, we ask for labor to start at a time when we won't have to sit in crazy Nairobi traffic to get to the hospital (please no birthing a baby in our car!). Lastly, we ask for Kristin to produce abundant milk to feed this new little one and we believe in faith that that is fully possible. With you, all things are possible! And oh how we long to give you the glory in the retelling of this birth story! We also pray for more workers. For others to answer the call to share Jesus among unreached peoples. May we love so deeply that we share not only Jesus, but our lives with our neighbors as well. Speaking of neighbors, we ask for opportunities to establish and deepen relationships with muslims who live in our neighborhood, and that they may come to know you, love you, and share you with others. Thank you for caring about the details and walking us through this! 2017: WHAT A YEAR IT'S BEEN! Our last year as a family of four! In March we will become a family of five. I'm still wrapping my brain around that one. And I think because we are waiting to find out the gender of this little baby (like we have with all our babies) it makes it even that much more surreal. 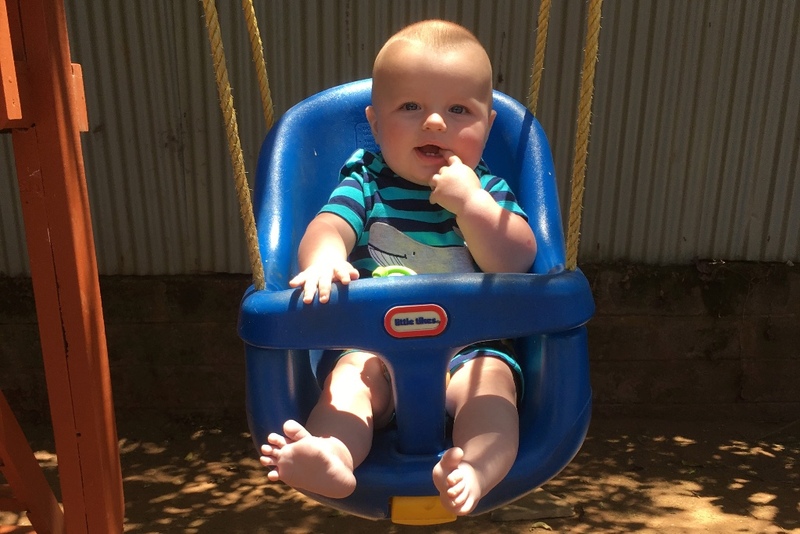 We literally don't know the most distinguishing thing about this tiny human - are they a boy or are they a girl? Only God knows. And in a few short months, we will know too. And I'm certain, because it's happened with both our other two kids, that from that moment on - from the moment we meet our number five - we won't be able to imagine our lives without him or her. But for now, it still feels like a dream, like it will always just be the four of us. 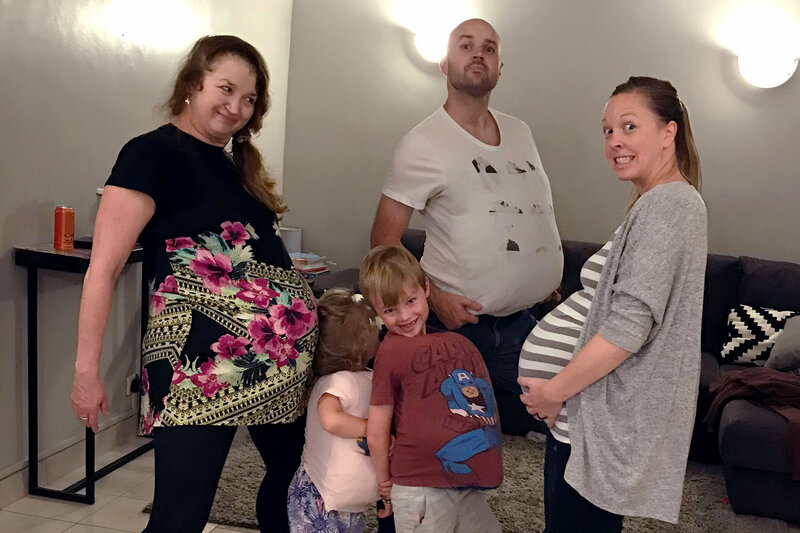 So, while I'm struggling to fully grasp the reality that's about to hit us all, I've decided to instead just take a quick look back at some highlights from 2017 - our last year as a family of four. 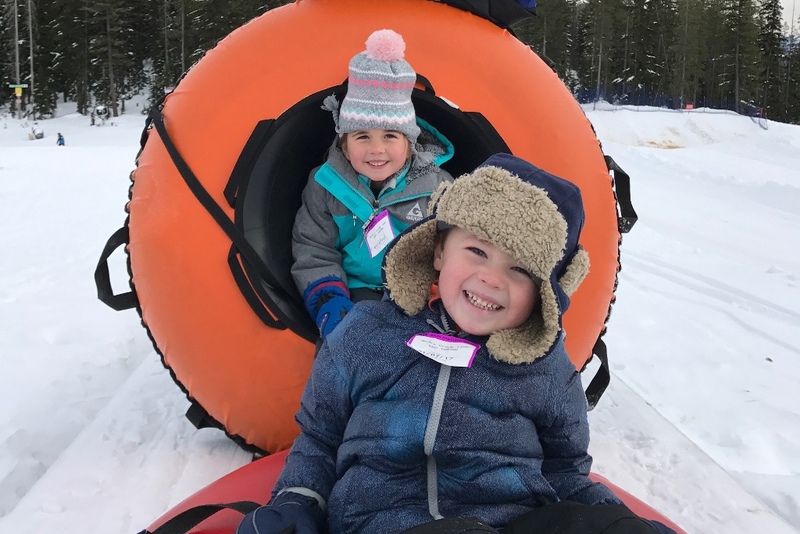 Last January was filled with snow and sledding and cousins! 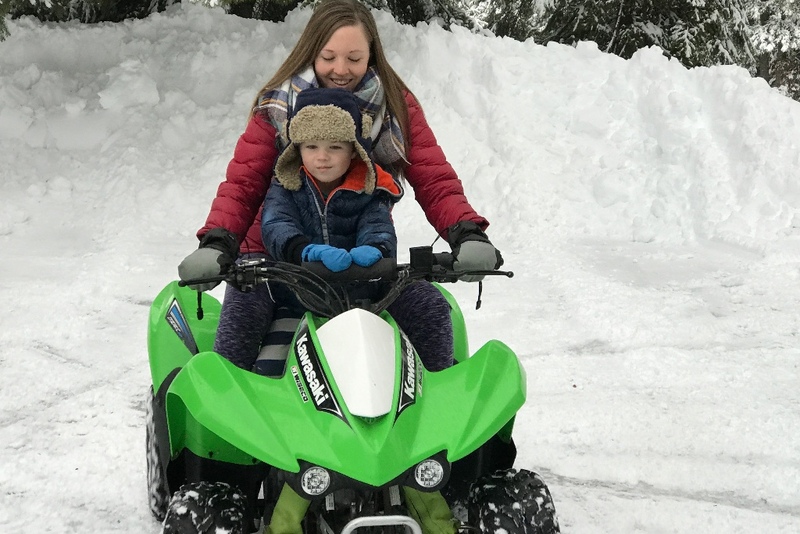 February brought even more snow, which meant lots of rally rides on what we lovingly call "The Green Machine" - Jordan's parents' little four wheeler! 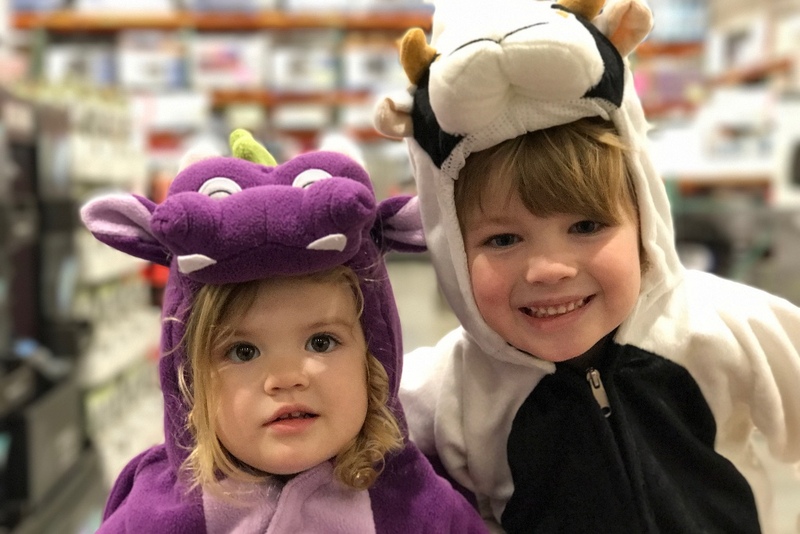 In March we let our kids dress up in Halloween costumes just to go to Costco (knowing Halloween would be a thing of the past for us)! 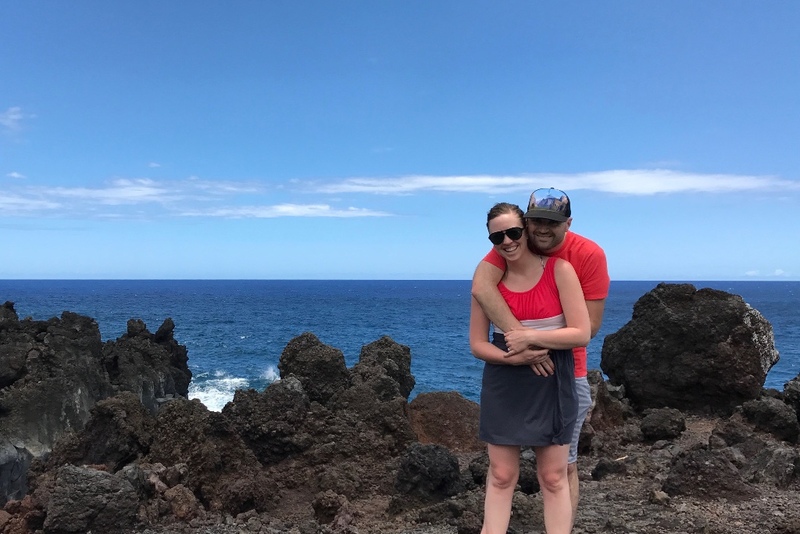 April allowed just the two of us time to celebrate our 10-year anniversary (a few months early) in Maui - what an incredible blessing!! 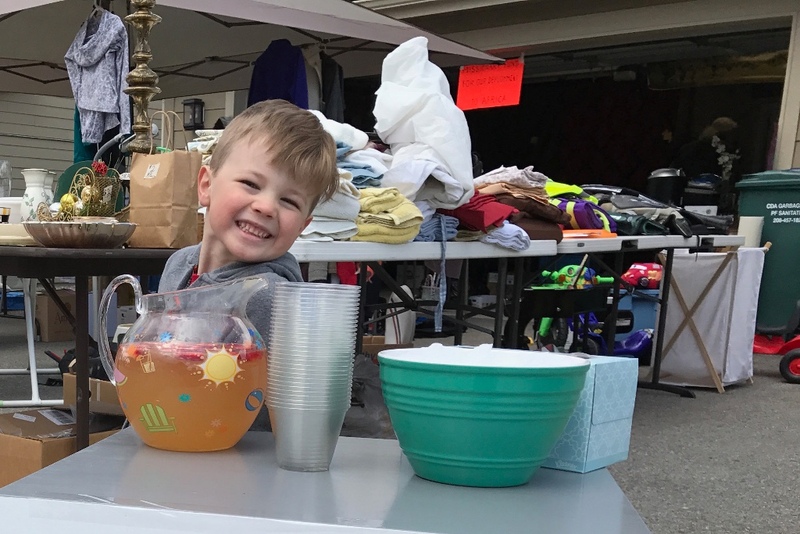 In May we sold many of our earthly possessions at our big garage sale, which, of course, included a strawberry lemonade stand! June brought lots of travel to see and say goodbye to friends and family, and we even snuck in a camping trip with dear friends! 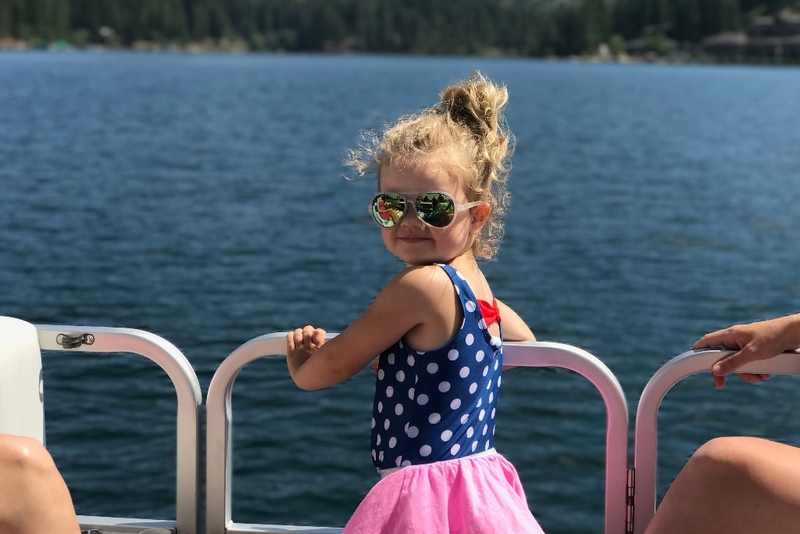 July was spent around North Idaho, mostly out on the lake with friends and family, and this little lady turned three! In August, we said our final goodbyes, or as we prefer to call them "see you later's" and boarded the plane for Nairobi! September will always remind us of our transition house - where we first lived when we arrived in Nairobi. The kids had a pretty sweet fort there! In October we took the kids out to the Giraffe Center, which is only about a 30-minute drive from our home. They absolutely LOVED it! 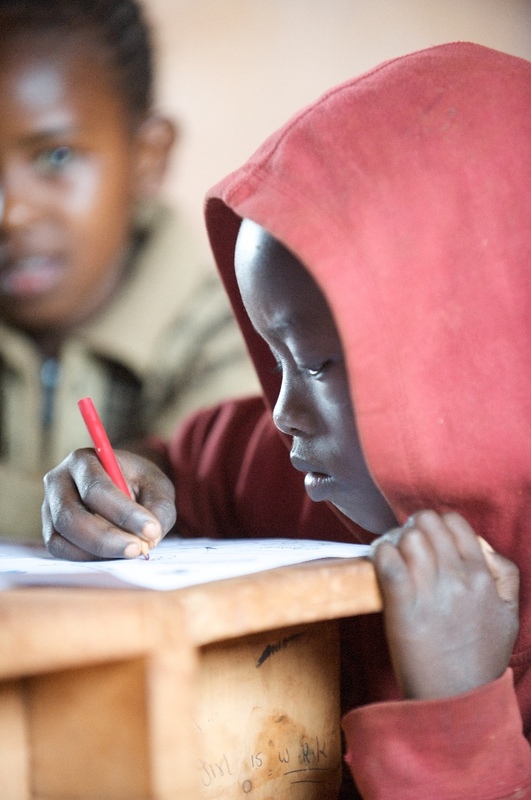 November meant the end of the school year for many of our local Kenyan neighbor kids. Moses and Zuri have loved making lots of new friends! December's highlight was the camping trip we just took with new friends who serve with AIM AIR. We all felt so refreshed getting out of the city! If you would like to make a gift to our ministry for the 2017 tax year, you can make it online up through tonight at midnight EST. Just click HERE. Thank you!! You have truly blown us away with your goodness this year! Somehow our entire family moved across the globe and you have been in every step. It certainly hasn't been easy. This year was filled with some very high highs and some very low lows, and saying goodbye to so many of our dear loved ones was most definitely one of the hardest things we've done yet. But as you've called us, you've been faithful to walk with us. And we know you are in this move. 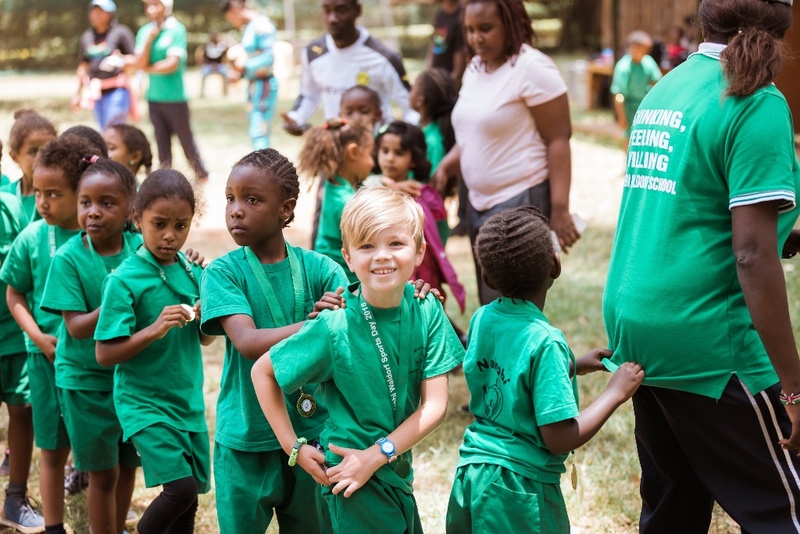 Transition to life in Kenya has also not been easy, but at the same time, we've been welcomed into the AIM family here in Nairobi with open arms, which has made it so much easier than if we were trying to do this ministry alone! As we move forward into 2018 our prayer is that we would find our place here in Nairobi more and more, that we would have more opportunities to share about you - who you are, what you've done and thus who we are in you. We love you with our whole hearts!